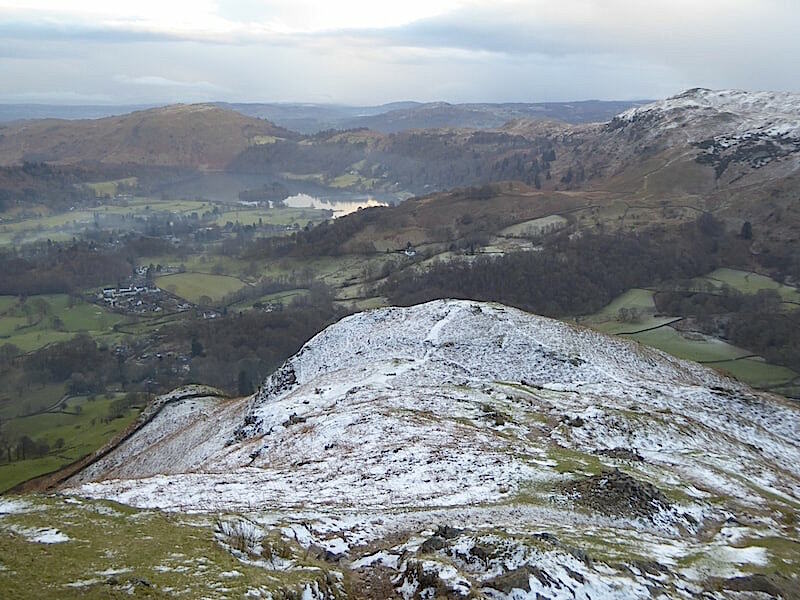 For today’s walk we started out in Grasmere to walk the length of Far Easedale and then returned by way of the ridge route from Calf Crag and on to Pike of Carrs, Gibson Knott and Helm Crag. 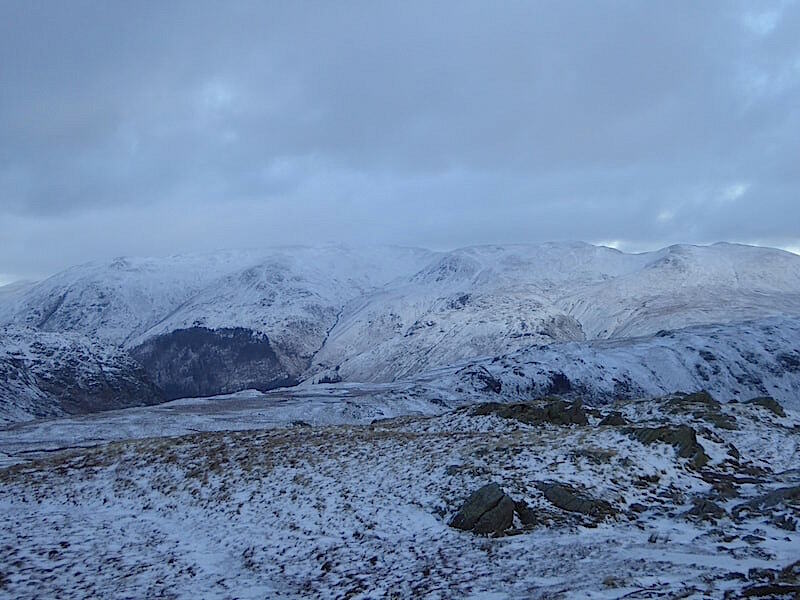 It was forecast to be rather on the windy side on the higher fells so Far Easedale offered a calmer alternative, being sheltered by moderately high fells on both sides. It was also supposed to be a sunny day but, just as in our last walk, the initial sunny morning promised much and then failed to live up to expectations. 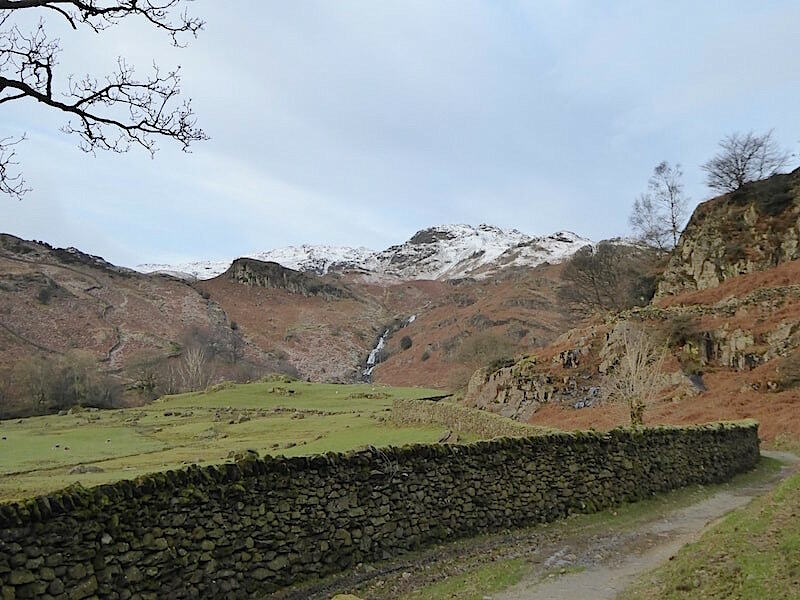 Its a long valley with some very impressive rock scenery all around it and the route follows, for the most part, the course of Far Easedale Gill with a series of waterfalls, chutes, slides and cascades all along its length. 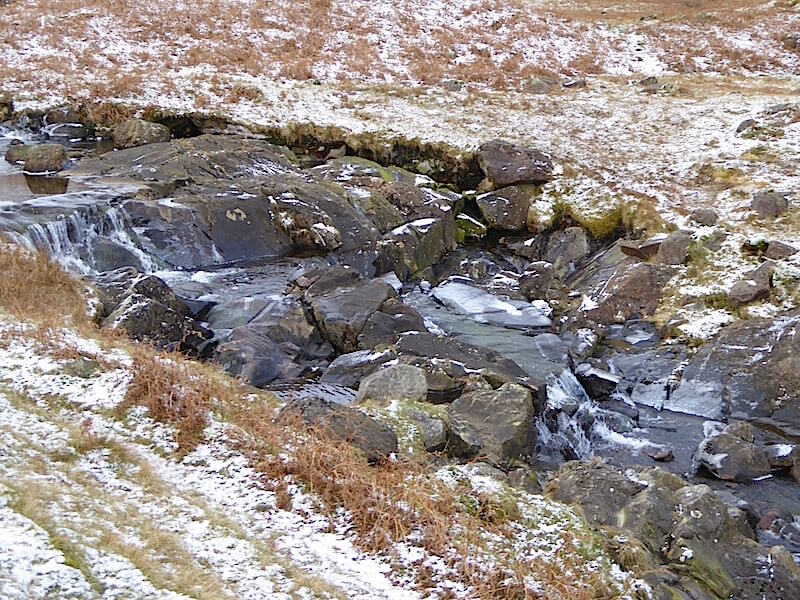 A quote from AW sums up the valley’s main characteristic – ‘Far Easedale is wet underfoot in many places, always.’ However, the current spell of sub zero temperatures had transformed much of the valley’s water into solid ice which made our walk a whole lot less soggy than it otherwise would have been. 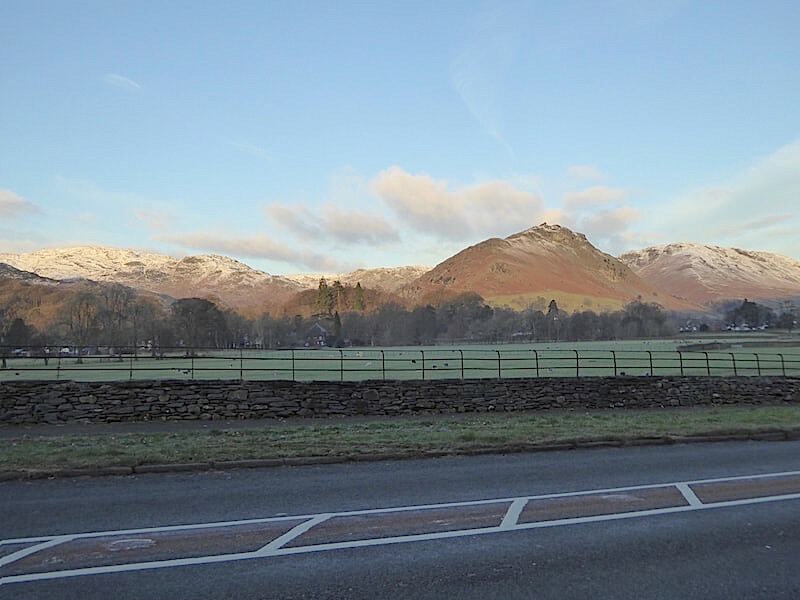 We left home in a temperature of -4C and things hadn’t warmed up significantly by the time we parked up in the lay-by on the A591 just outside Grasmere. 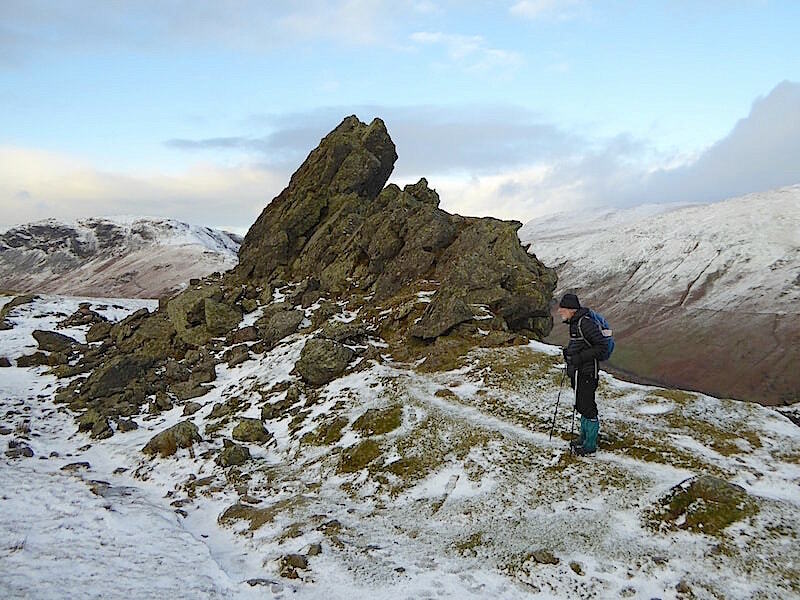 We’re snuggled into full winter kit, the spikes are ready in our packs, the gps is flashed up and with the sun just beginning to light up the Grasmere fells we’re good to go. 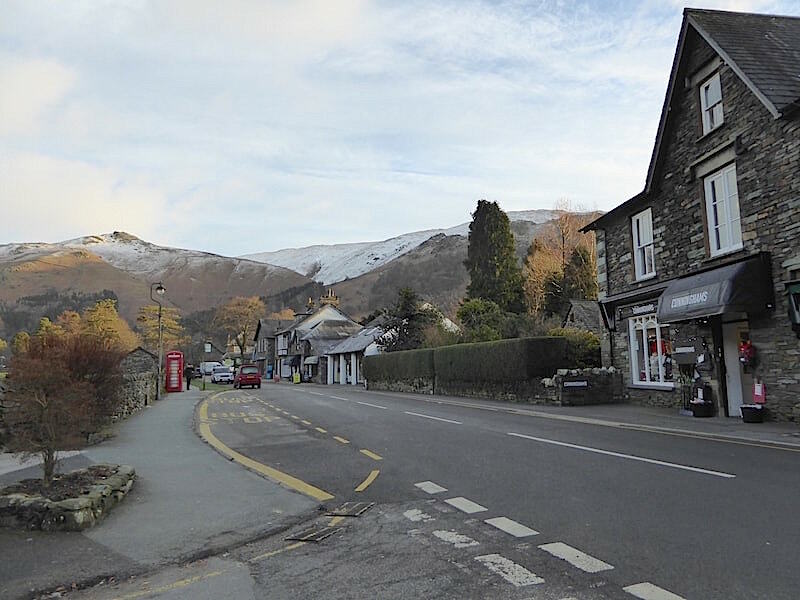 The hotels, guest houses and B & B’s were all serving breakfast to their respective guests so the streets of Grasmere were just about deserted as we cross the road at Sam Read’s bookshop and begin walking up the Easedale Road. As we walked up the road this attractive wintry scene on my right caught my eye. 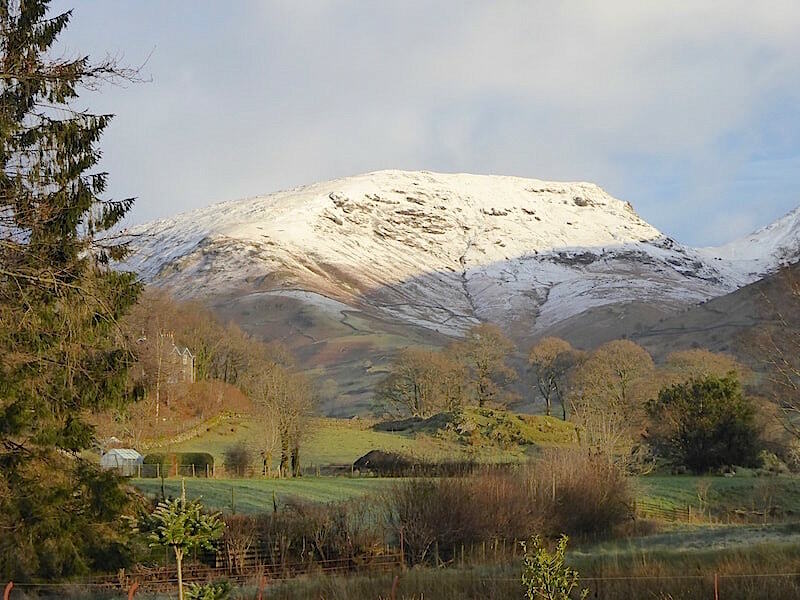 The morning sun lighting up Seat Sandal and casting a lovely soft glow over Grasmere’s fields and trees. 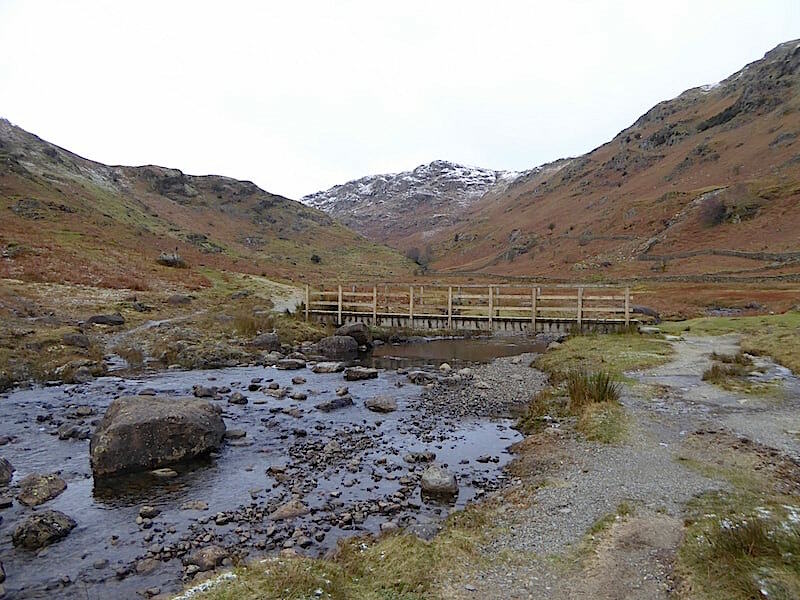 Crossing the bridge on the left would take us into Easedale, but that’s not for us today so we carry on just a few more steps and follow the road around to the left. 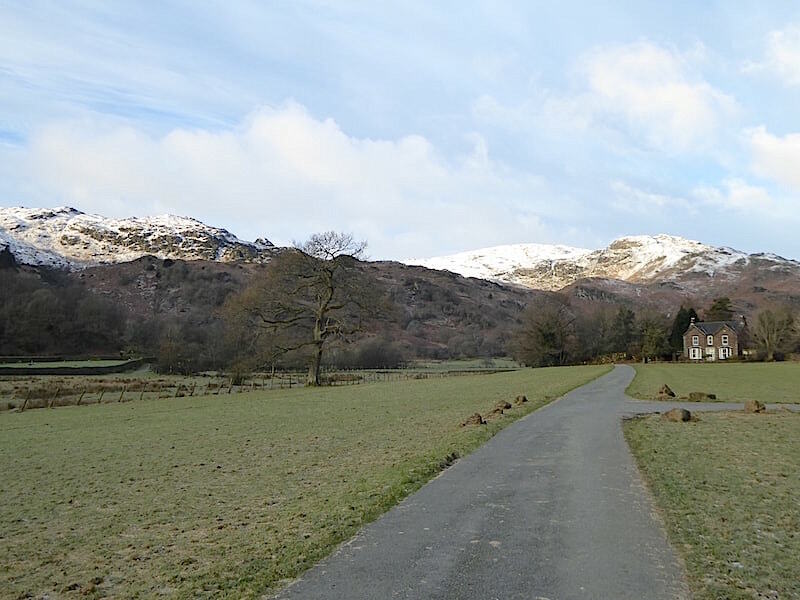 The view along Easedale looking towards Tarn Crag as we follow the curve of the road …..
….. which takes us over this farm access road and across the open pasture. 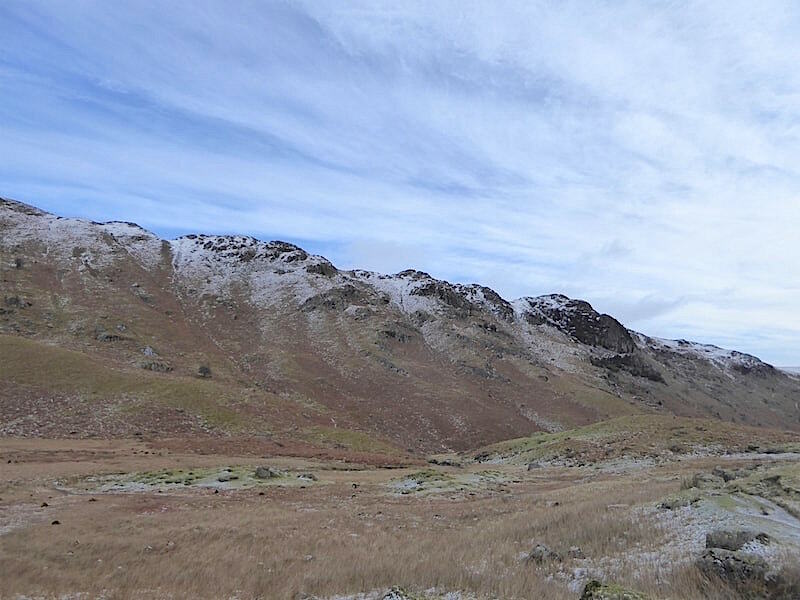 A blue sky ahead and some light cloud, its all looking very encouraging and spirits are high as we look forward to a sunny day on the snowy fells. 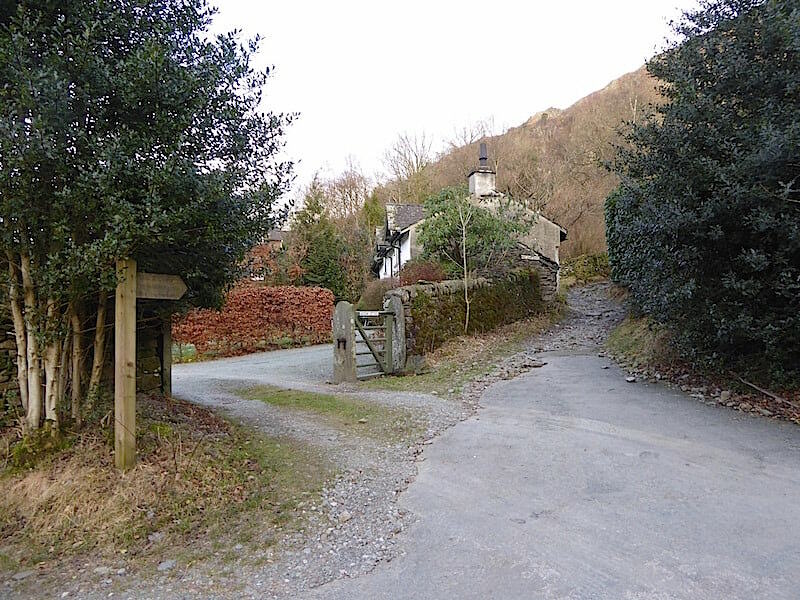 The access road comes to an end at Brimmer Head Farm and the signpost indicates the path to Far Easedale. Up to this point all we’ve done is walk on tarmac so its only at this point that we feel that we are really beginning our walk. The tarmac gets left behind and a rough and stony track takes its place. 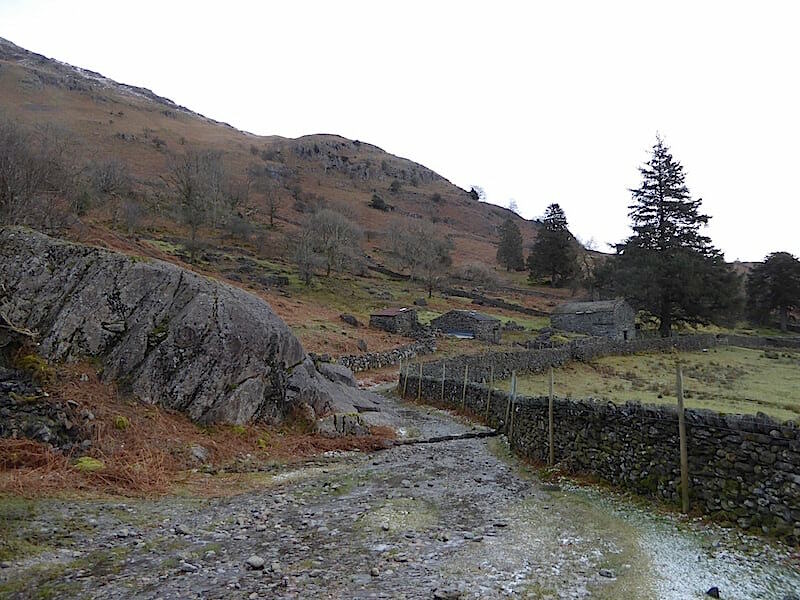 A little further on we pass the right hand turn off for the path which leads up to Helm Crag. A lady out walking her dog branches off up it, while we veer round to the left and drop down slightly to negotiate a slope which was ankle deep in saturated fallen leaves with rivulets of water flowing over, under and through the entire soggy mass. Obviously this little slope has a micro-climate of its own because there wasn’t a hint of frost or ice anywhere along it, despite that it was as slippery as a banana skin and we gave it a bit of respect as we made our way down it. 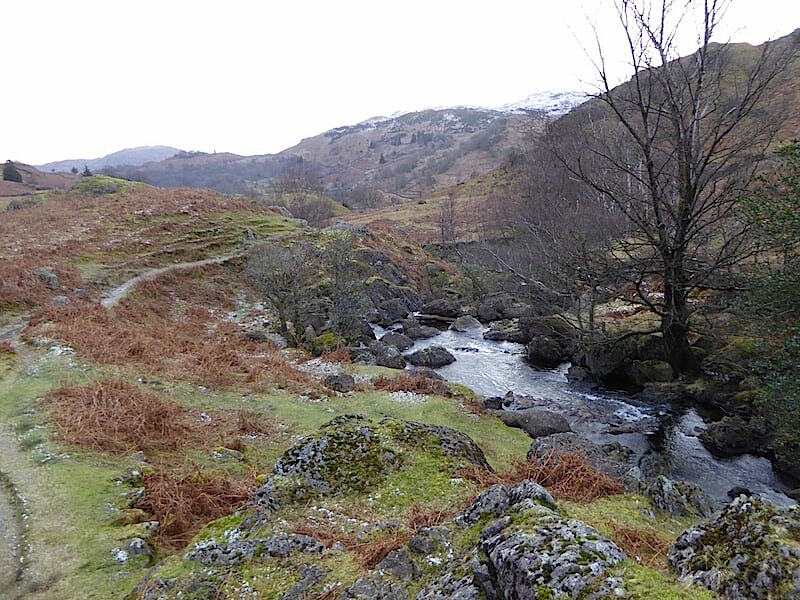 Our view of Sourmilk Gill and Tarn Crag as we walk along the rough track alongside the wall. 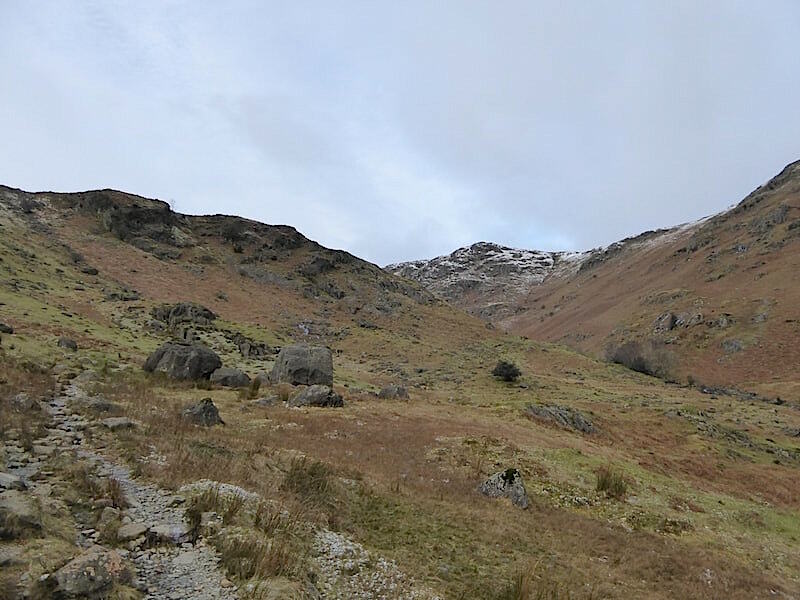 From the beginning of the rough track and on up to Stythwaite Steps could be thought of as the first, or lower, section of Far Easedale. 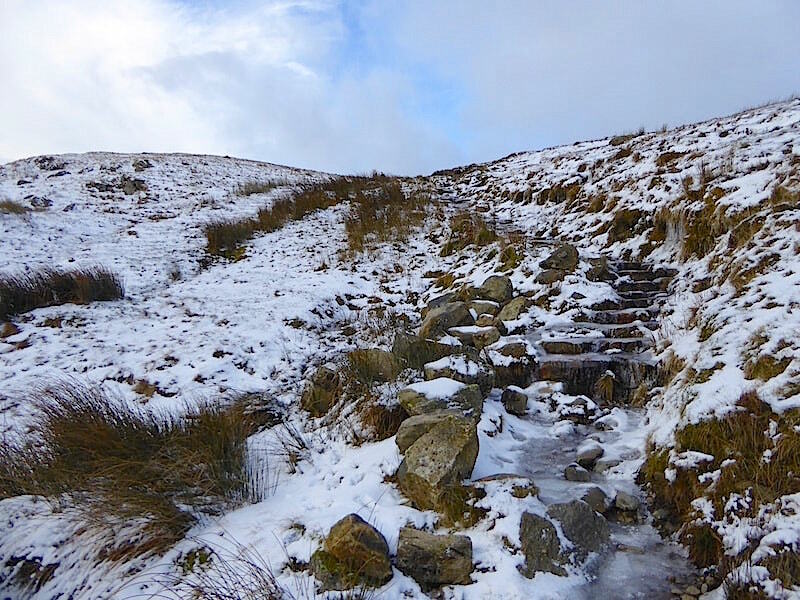 The path, which was very icy in places, is mostly level in its initial stages although it has a few gentle rises as it makes its way up to another level. A look back along the track at the old barns alongside it. The track was becoming ever more icy so, as we had some handy rocks on which to perch, we stopped here and put the spikes on. A couple came by as we were doing so and, as always, greetings were exchanged. The sky has clouded over …..
….. but ahead of us the sight of a still blue sky is more than welcome. The two walkers who had passed by us as we were adding the spikes are on the path just ahead of us as we enjoy a pleasant spell of level walking alongside the gill. Looking back along the icy waters of the gill. 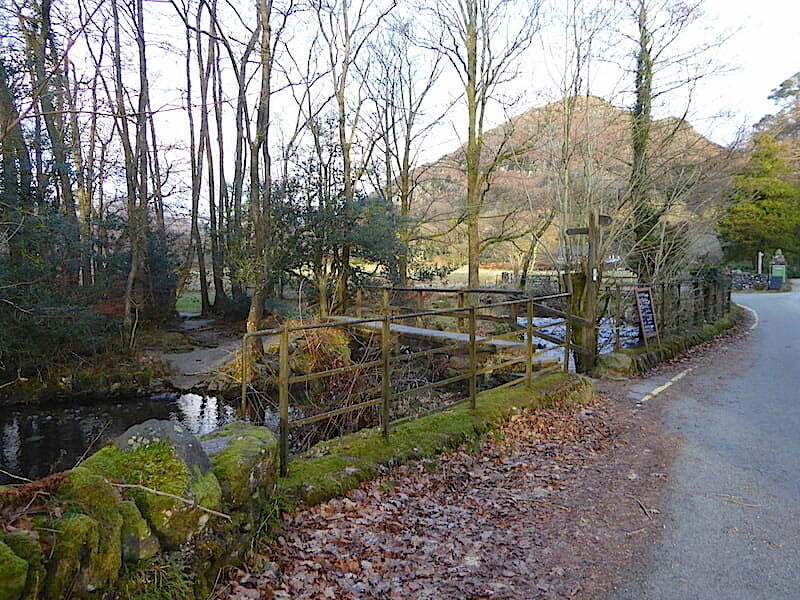 Stythwaite Steps and Bridge and here endeth the first section of Far Easedale. 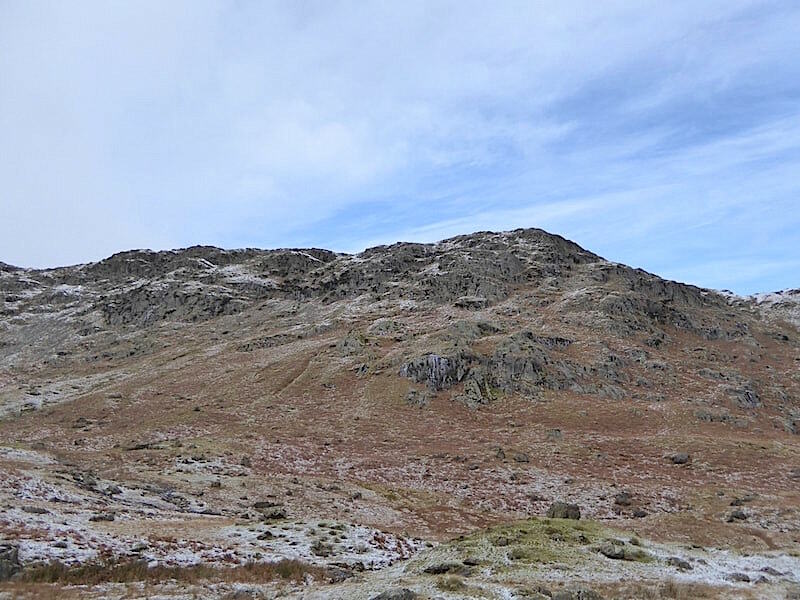 As we didn’t see the pair of walkers anywhere ahead of us as we continued on up the valley we assumed they had gone straight across and taken the path up to Easedale Tarn or Tarn Crag. 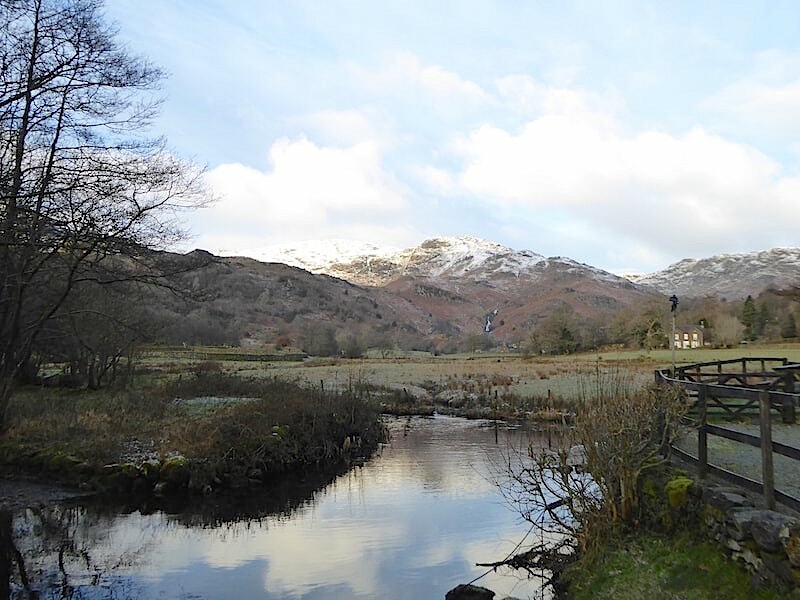 Just above the bridge on the centre skyline is Pike of Carrs which we’ll be walking back over a little later on. For now though there’s a whole lot more valley to be walked. 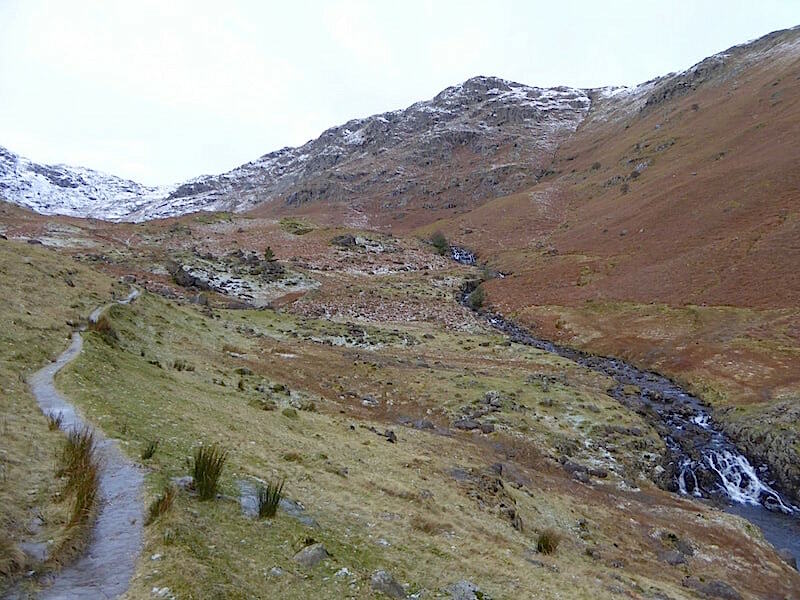 Once across the bridge we take the right hand path so here beginneth the second/middle section of Far Easedale. The path is icy most of the way along, its becoming more rugged and remote, there’s a hint of cloud beginning to build, and there isn’t another walker in sight. 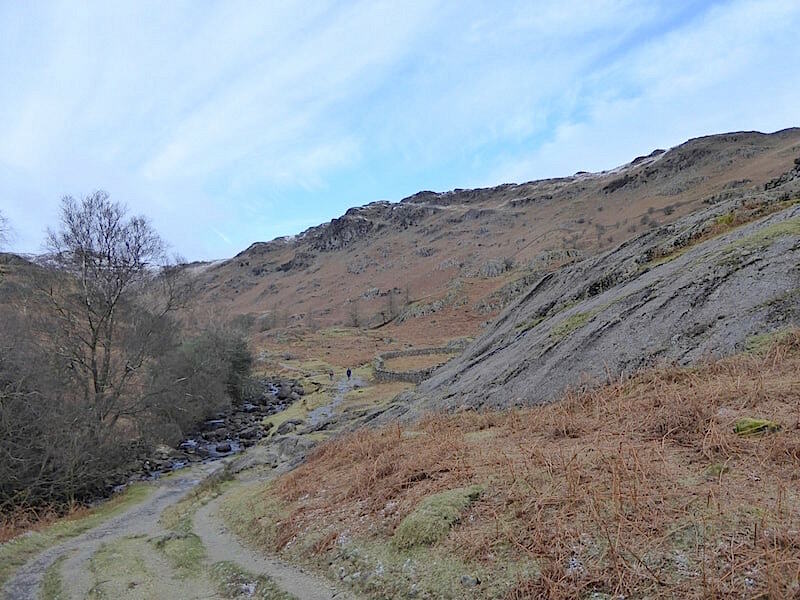 A steady climb up from the bridge crossing brings us out onto another fairly level section of path from where I took a look back at Helm Crag across the valley. 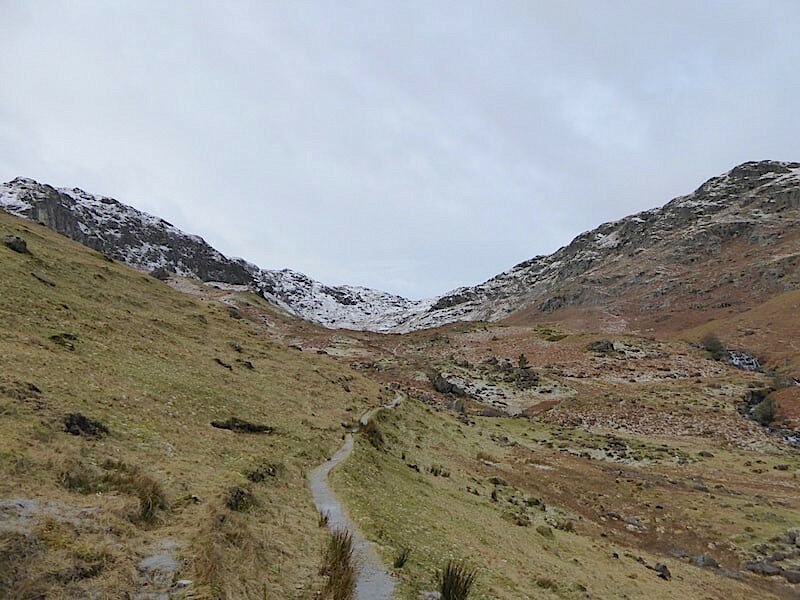 The path has veered a little way from the gill for the time being but there are a few smaller and shallower rills along the slopes, most of which were largely frozen over today. They weren’t frozen solid though, water could still be seen flowing under the thin layer of surface ice so it wasn’t a good idea to try stepping on them. That’s one very bleak looking sky behind us. A little further along and we have the gill, with falls and cascades aplenty, for company again. We’ve taken to walking on the grass now that the path has a surface more suited to a skeleton bobsleigh event. Yes, I know we are wearing spikes but it just happens to be that bit easier on the grass. 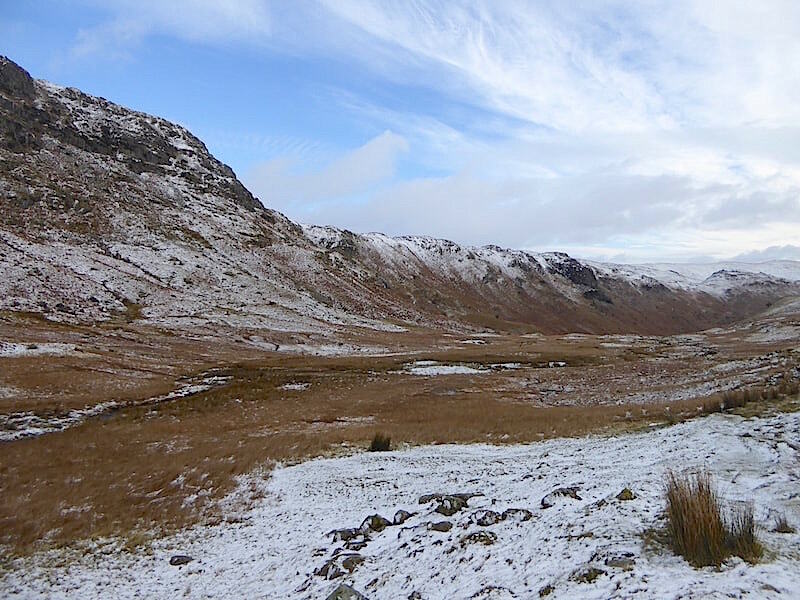 Looking to the head of Far Easedale as we continue along the middle section of the valley. On the centre skyline we are beginning to convince ourselves that we can see the saddle where we will emerge from the valley to make our way over to Calf Crag. 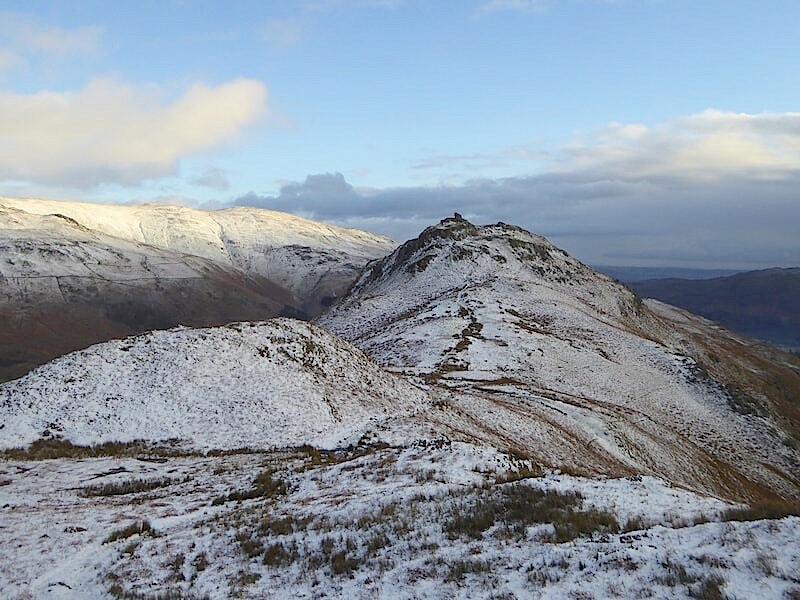 On the left skyline is Deer Bield Crag while over to the right is Pike of Carrs. 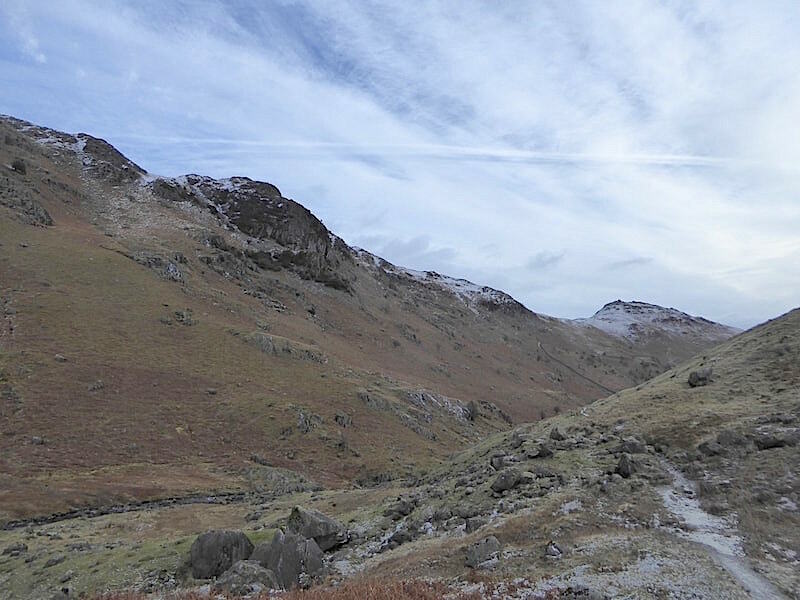 The skies behind us brightened for a while so I took this shot looking back at Gibson Knott and Helm Crag while they still had some blue sky above them. We’ve climbed a little higher and the path has veered away from the gill once again. 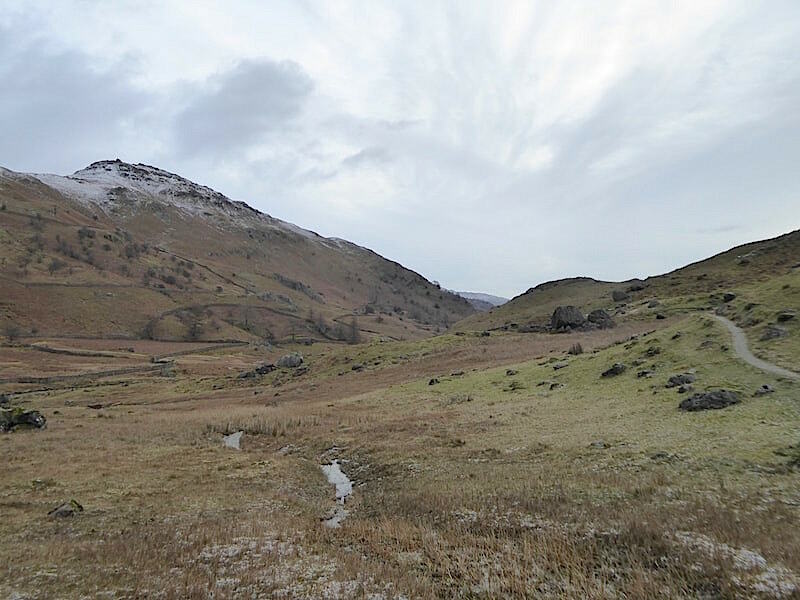 The path is never excessively steep and in your face but it continues to climb gradually and leads us on towards Deer Bield Crag …..
….. and the large expanse of wetland below it. Perhaps it will be frozen solid but there’s only one way to find out, so we drop down to the flatter and grassier ground just below the little semi-circle of stones in the shot to take a look-see. It wasn’t frozen solid but it was firm enough not to have us sinking in it up to the ankles. 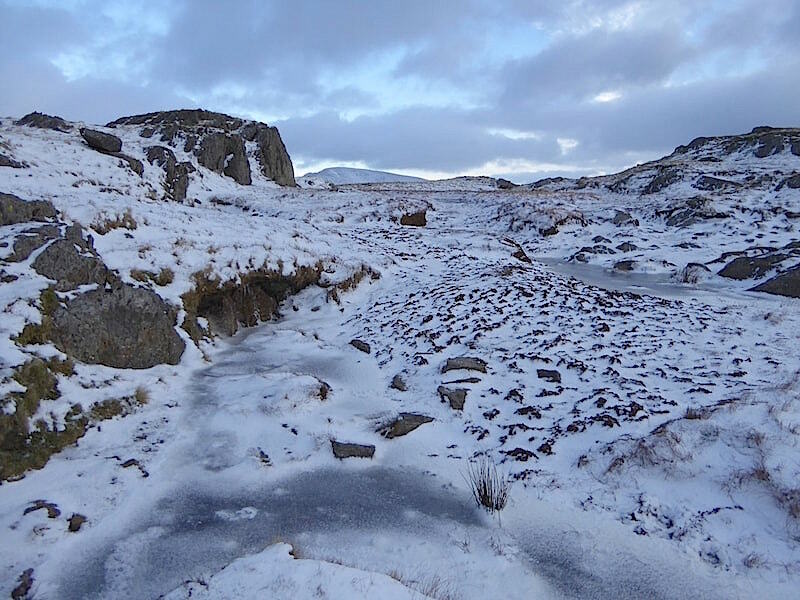 We had to abandon the path several times as it was full of deep puddles with only a couple of centimetres of surface ice, and far too thin to bear much weight. 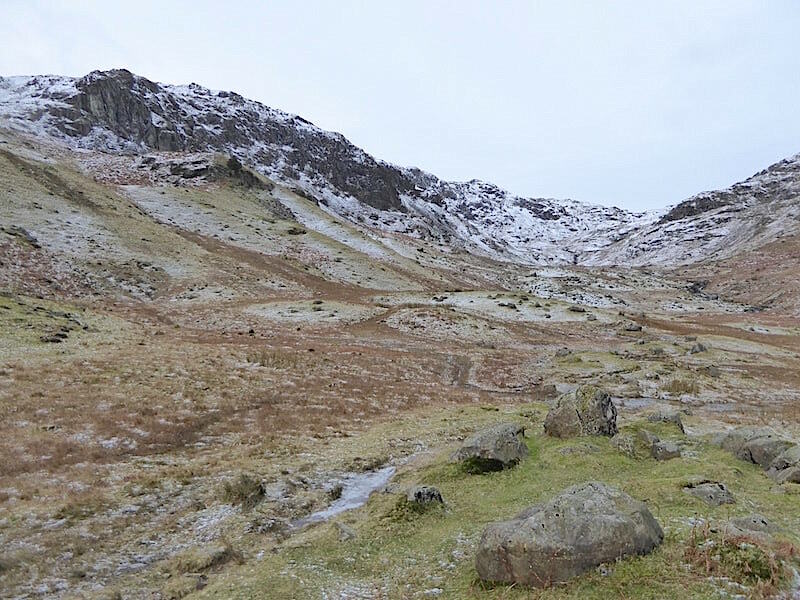 This involved quite a few lengthy detours up the slopes and back down again in order to avoid the worst of the squelchy, and only partly frozen, areas of vegetation. We had reached a suitable dry point with some handy rocks to perch on so we decided to stop and take a coffee break, Just as we were getting the flask out a solo walker came by and had a chat with us. 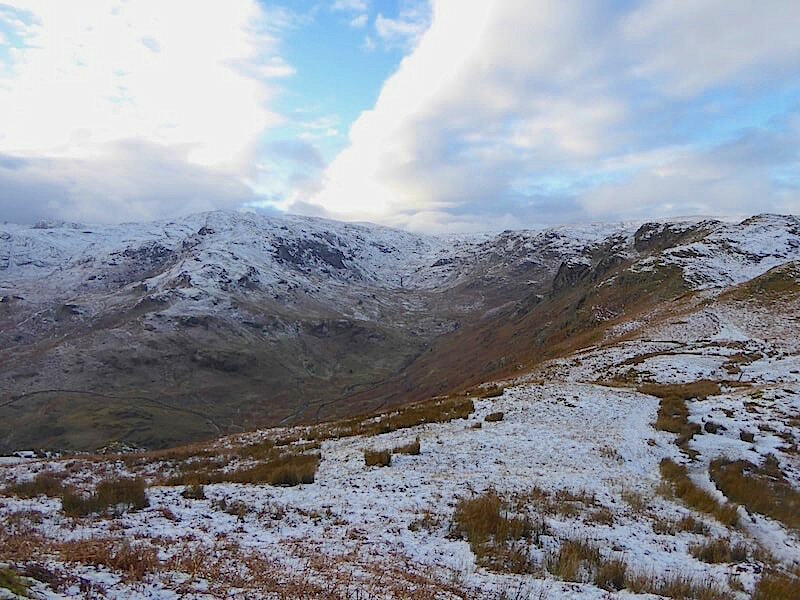 He’d started out up Steel Fell just as the sun was beginning to rise, carried on over to Calf Crag and then across to the saddle to make his way down the valley. We exchanged information about the state of the paths too before he went on his way and we settled down for a much needed drink of hot coffee. 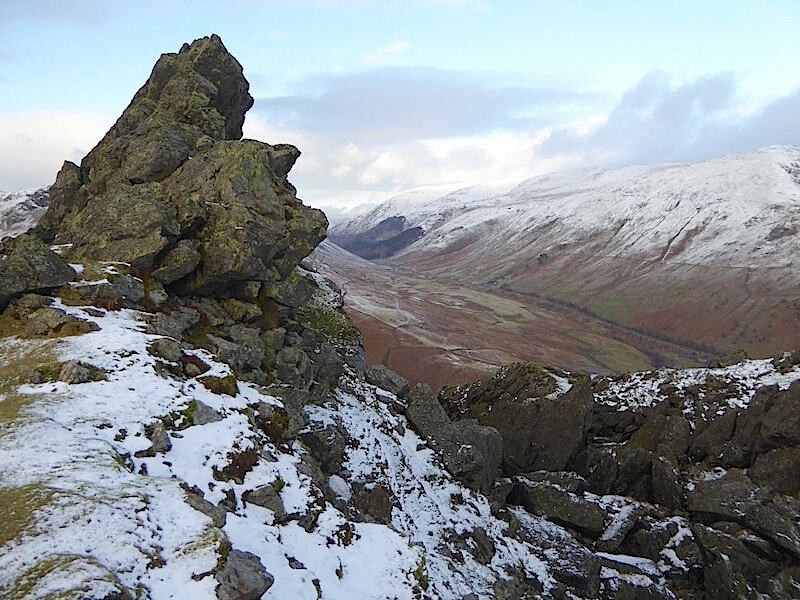 From our perch we had a grand view of the humps and bumps along Gibson Knott …..
….. while directly opposite an equally impressive view of Pike of Carrs. 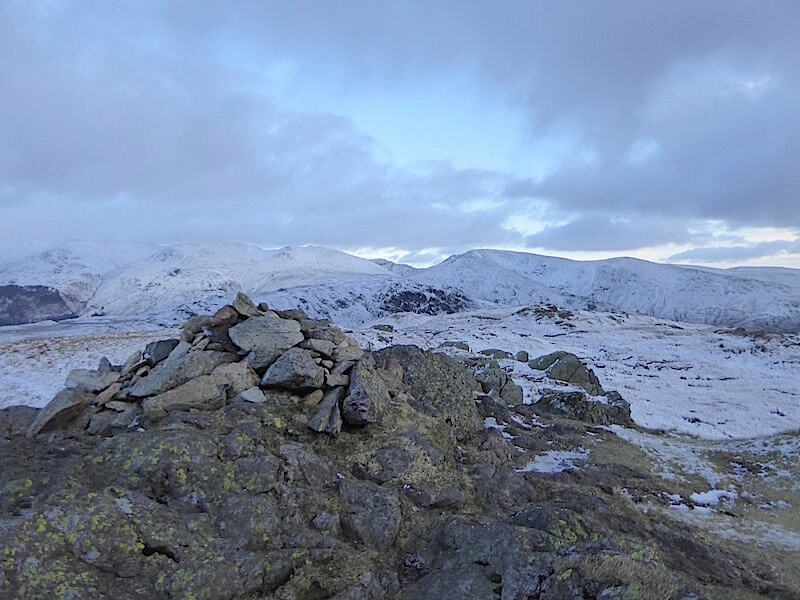 The eastern side of the Lakes looks to be hanging on to the blue sky …..
….. while behind us to the west the skies above Deer Bield Crag are much cloudier. While we were enjoying our break I suddenly noticed that something didn’t look quite right with the spikes on my right foot and on closer inspection found that I had put that one on upside down so that the spikes themselves were doing a very good job of gripping the soles of my boot, and doing an absolutely useless job of gripping the ground. So I’ve walked all the way from the spike stop up to this point with only my left spike doing anything useful. How come I didn’t notice that? What a dumbo! The right foot spike having been put back on correctly we set off again with plenty more detours around the soggier areas and a few more icy cascades to view along the way. We finally emerge from the wetland so I took a look back for this view across the valley of the long ridge from Pike of Carrs on the left, to Gibson Knott in the centre, and Helm Crag at the far end on the right. 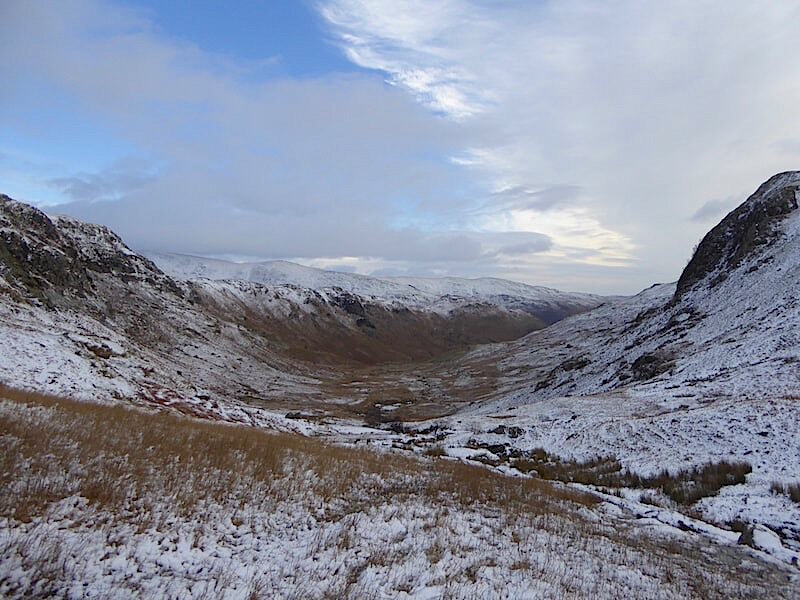 We’ve left the wetland far behind and we’re climbing a little more steeply now so here endeth the middle section of Far Easedale. We’re approaching the upper gill section which now becomes hard work in the icy conditions. We become very hot as we make our way up but removing a layer wasn’t the answer as it was very, very cold. Undoing zips and removing gloves wasn’t an option either, the almost instant chill which then bit into us soon put a stop to that so we just had to sweat it out. Faces were numbed by the cold while the rest of the body endured tropical conditions beneath the layers of winter clothing. 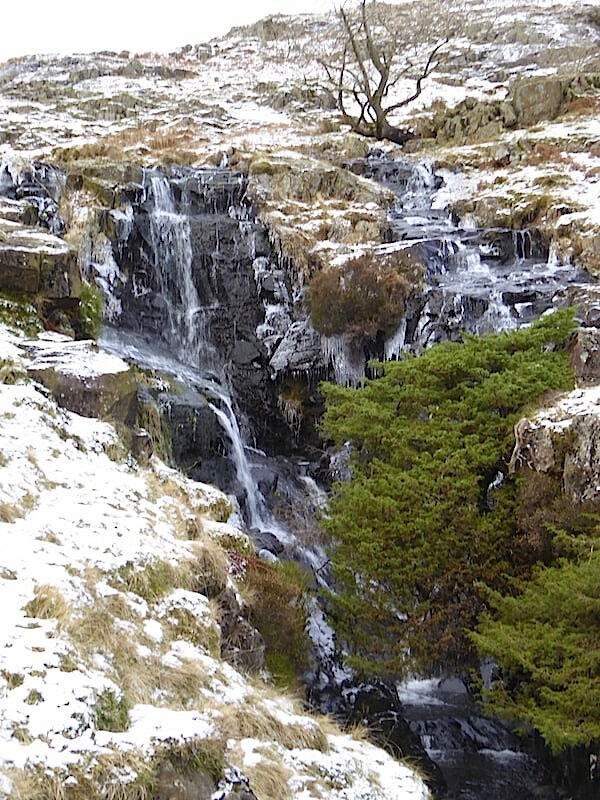 A splendid set of partly frozen falls in the upper gill section and just above them we have to make a re-crossing of the gill over towards the tree. That should be an interesting experience if nothing else. Crossing the gill wasn’t a straightforward affair as you can imagine. 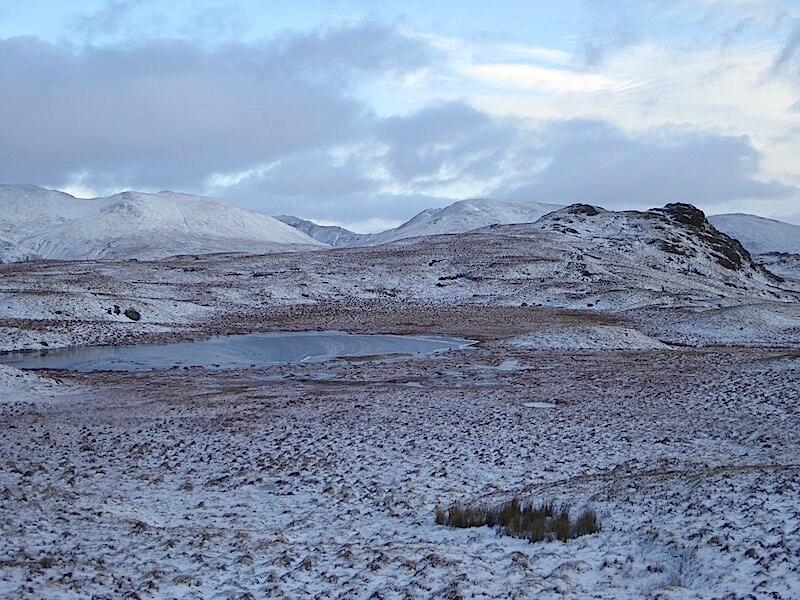 We’re much higher now, the temperature is lower, the ice is thicker and more widespread, all possible stepping stones were thickly coated, and snow, icicles and sheet ice covered the banks. It was just a case of ferreting around until somewhere suitable to cross could be found. 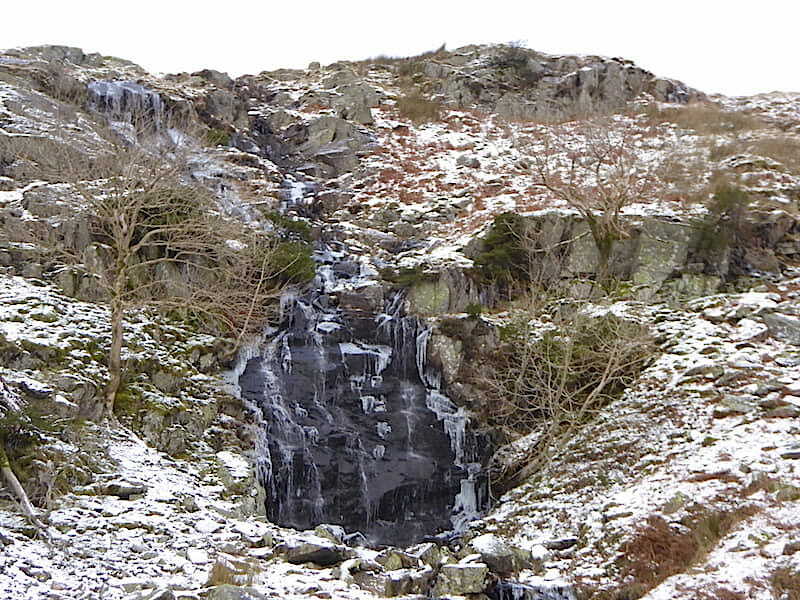 Another set of partly frozen falls coming in from the crags across the path from us as we continue the sweaty upward slog. We’re now crossing over Moor Moss where, at last, the rocky summit of Calf Crag comes into view over on our right. 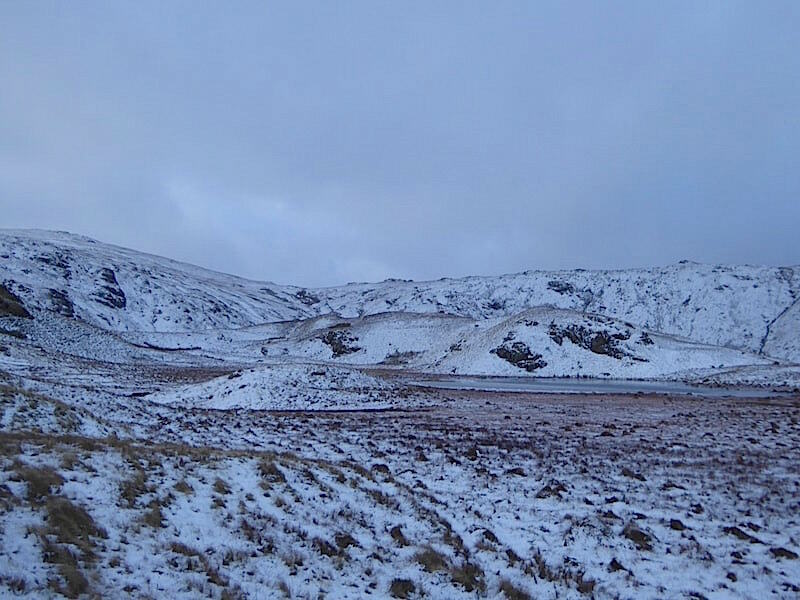 Moor Moss is a steepish climb across more soggy, and still not fully frozen, ground and the icy path was now alongside, and a good few feet above, the narrow gill over on the right. As hot as I was I didn’t relish the thought of plunging into the icy gill water so I moved over onto the grass and a firmer footing to take this view looking back down Far Easedale. 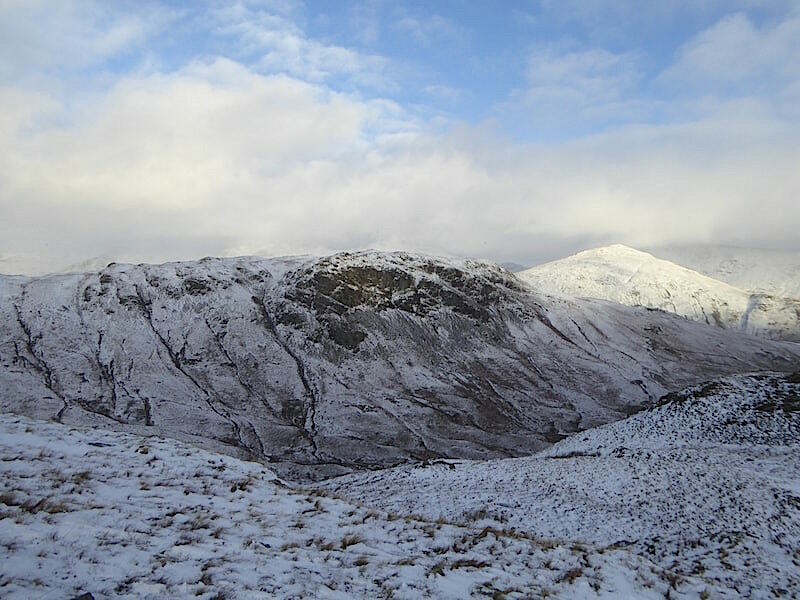 From the same place I turned the camera to my right for this shot of Ferngill Crag, bleak and menacing springs to mind. Above Moor Moss now and before we climb up to the saddle I take another look back down the valley before the view is lost. 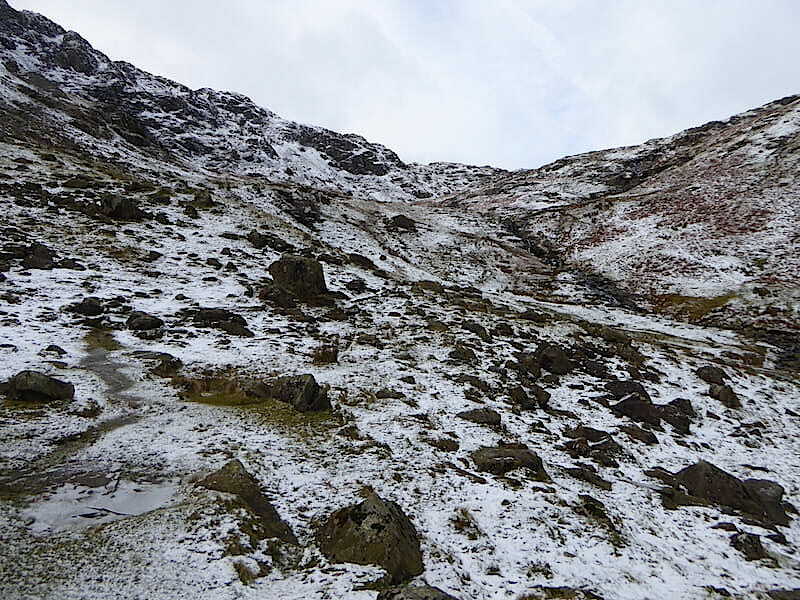 Turning round from the same spot and the very welcome sight of the last few feet, over the very icy steps, up to the saddle at the end of Far Easedale and an end to climbing for a while. If you zoom in you might be able to make out a couple of walkers just visible on the lowest point of the skyline. They began making their way down through the snow as we were digging our spikes into the sheet ice covering the steps. All the way along the valley we’ve enjoyed listening to the crispy crunch of ice cracking and splitting beneath our boots, but this was even more childishly satisfying as we stamped the spikes hard down into the thick ice and felt the icy slab crackle and yield. Our heat evaporated quickly once we reached the saddle where a keen northerly wind, together with some darkening clouds, was coming at us over Greenup Edge. 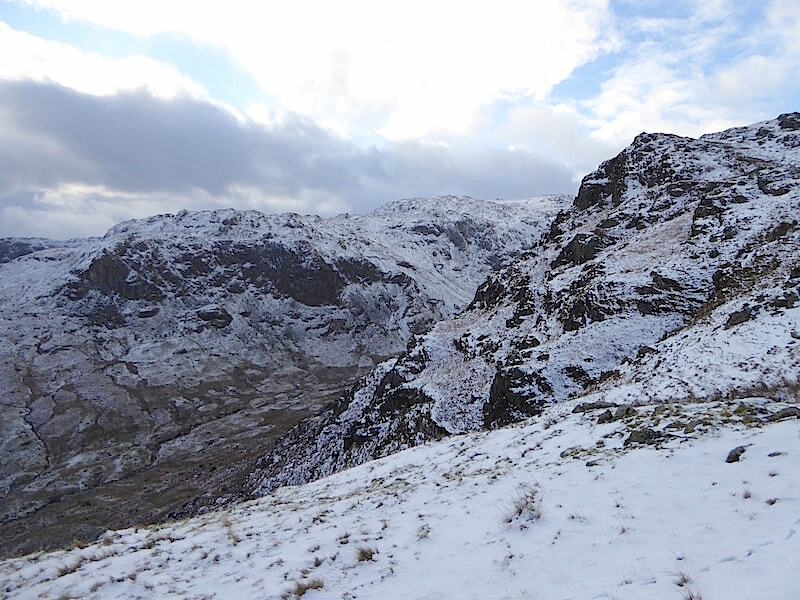 We don’t hang about in the chilly wind and begin to make our way over to Calf Crag. 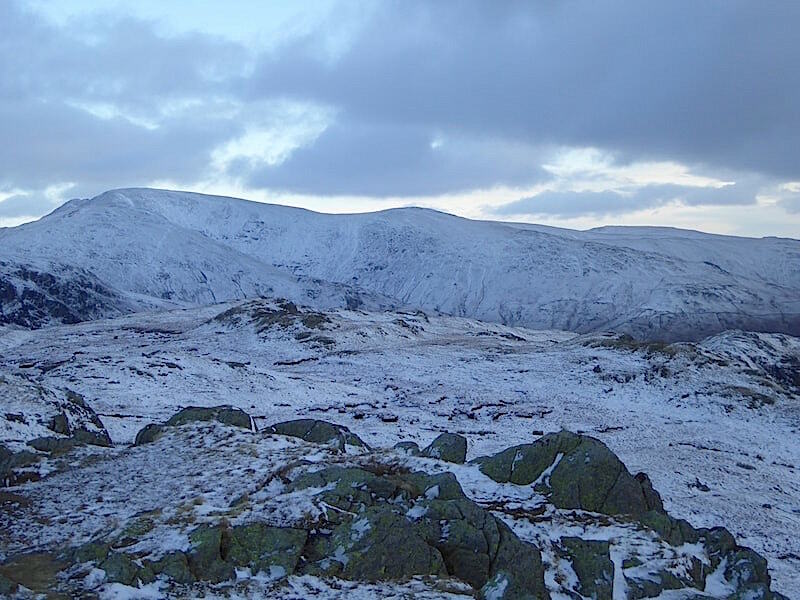 On the left skyline is a snowy Dollywaggon Pike and behind the summit rocks of Calf Crag is the equally snowy Fairfield. 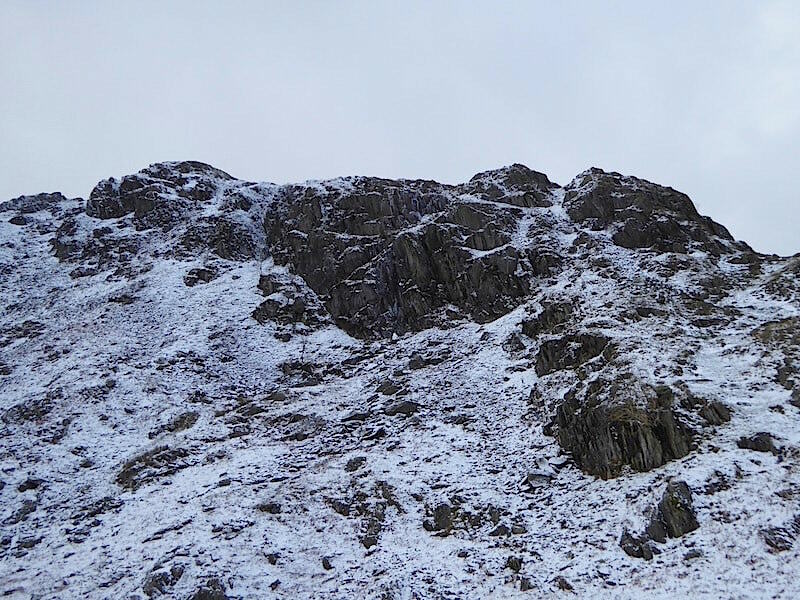 Between the two is just a glimpse of Saint Sunday Crag. Behind us the skies are growing darker as I take a look back towards Greenup Edge rising up to High Raise. 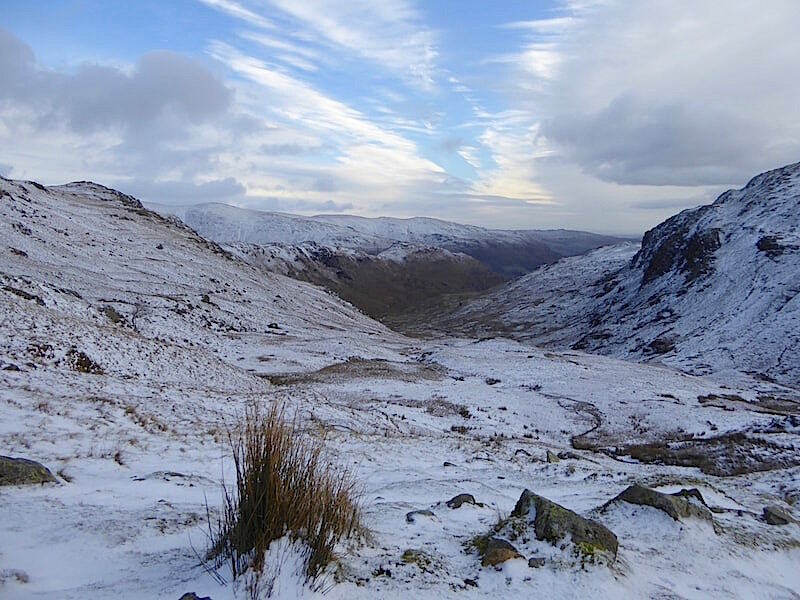 Brighter skies and more icy pathways ahead of us as we cross over towards Calf Crag summit. 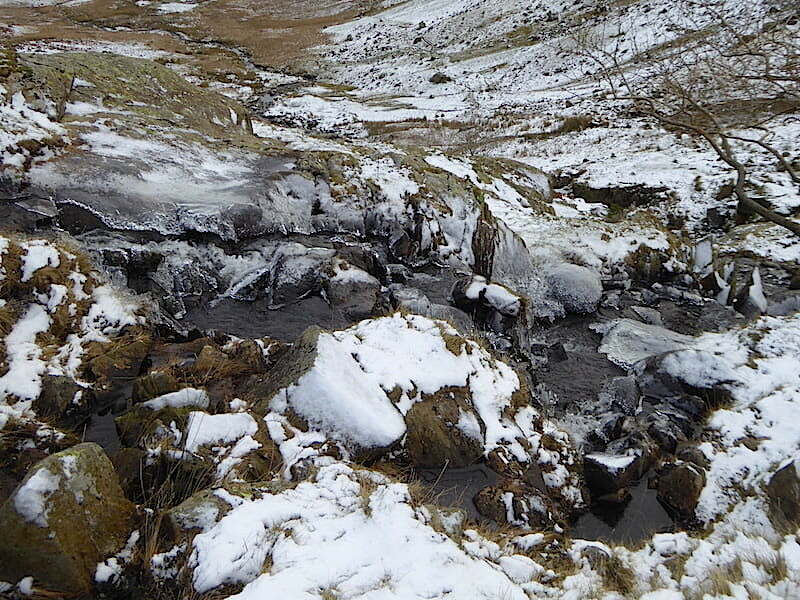 A closer look at a section of the icy path. The darker areas were deep puddles, which weren’t frozen solid, covered by a layer fine of ice, definitely not somewhere to put your feet, no matter how hot they are! From Calf Crag summit a view of the Helvellyn range over to the left, with Fairfield and Great Rigg over to the right. 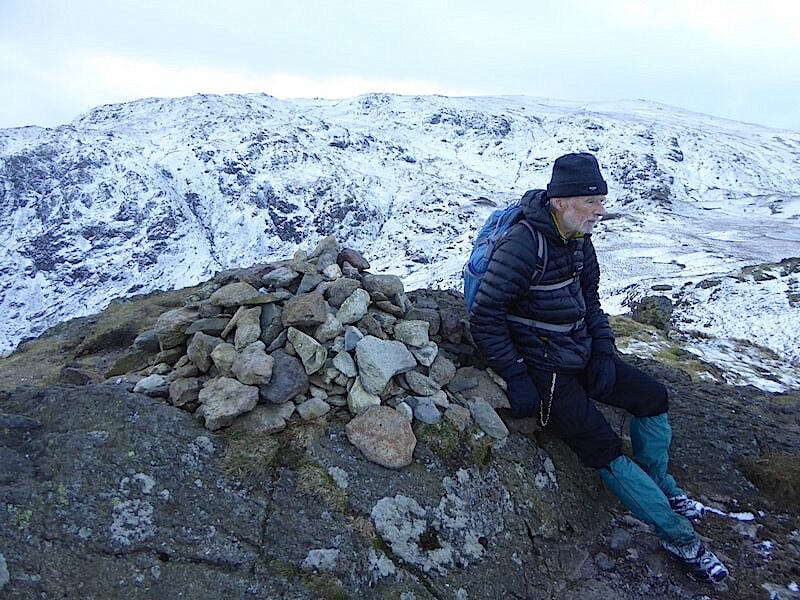 We still have the chilly wind so we only stayed long enough to take a few quick shots of the views from the summit …..
….. where cloud building was building over the Helvellyn range …..
….. to the south of the Helvellyn fells is Fairfield and its long slope down to Great Rigg …..
….. plus a quick sit down to rest the legs for a minute or two …..
….. and then its time to make our way over Pike of Carrs to begin the return leg of the walk. 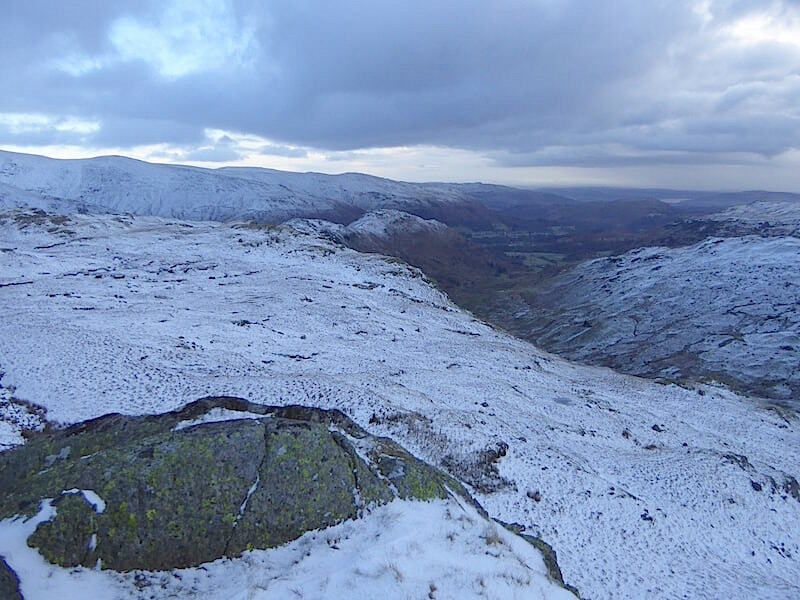 One of the very few sunny spells lights up Seat Sandal and a little slice of Great Rigg behind it. What a difference a little spell of sunlight can make. It was just along here that we became aware of a few snowflakes beginning to swirl around us. 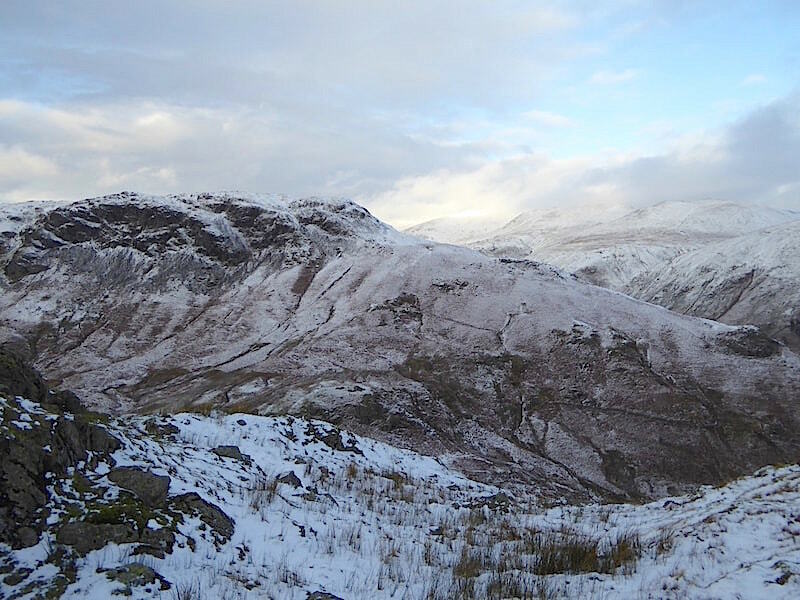 A look back to Calf Crag, the dark rocky peak over to the left, shows us where the snow flakes are coming from as the dark clouds begin to drift over us. 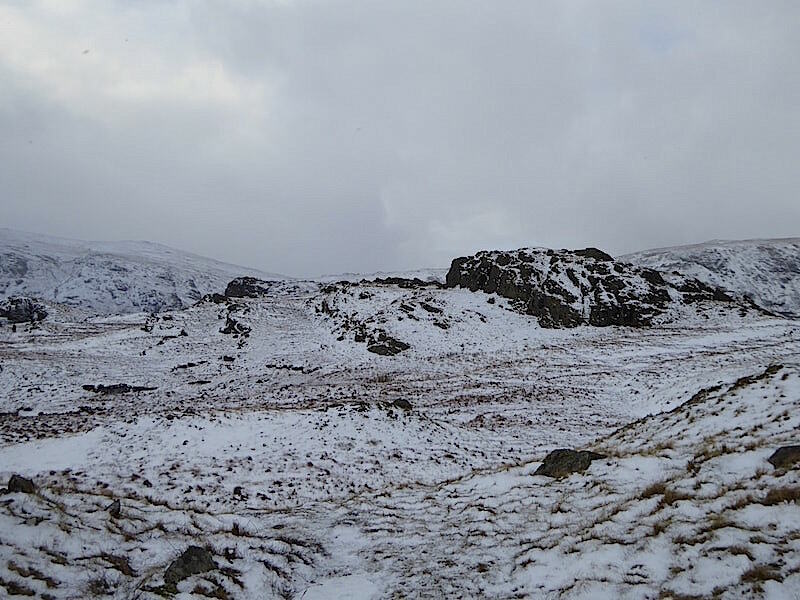 A couple of walkers, who arrived on Calf Crag as we were leaving, are still there although its difficult to make them out. Now that we were out of the wind we hunted out a suitable stopping place along here and out came the hot soup and sandwiches. A young pair of runners, faces pinched and reddened by the cold, passed by as we were tucking in giving us a cheery wave and a breathless ‘Hello’ before disappearing over the next little hillock. 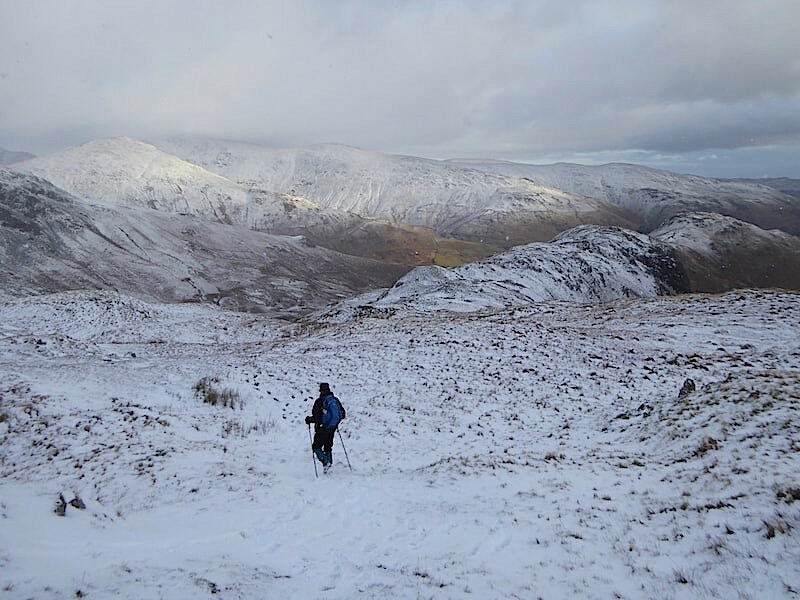 The snow continues to fall lightly and gently as we plough our way through the soft powdery snow covering Pike of Carrs. We left the spikes on so of course we each grew a couple of inches taller from time to time as the snow balled up around the spikes before it eventually slithered off again. 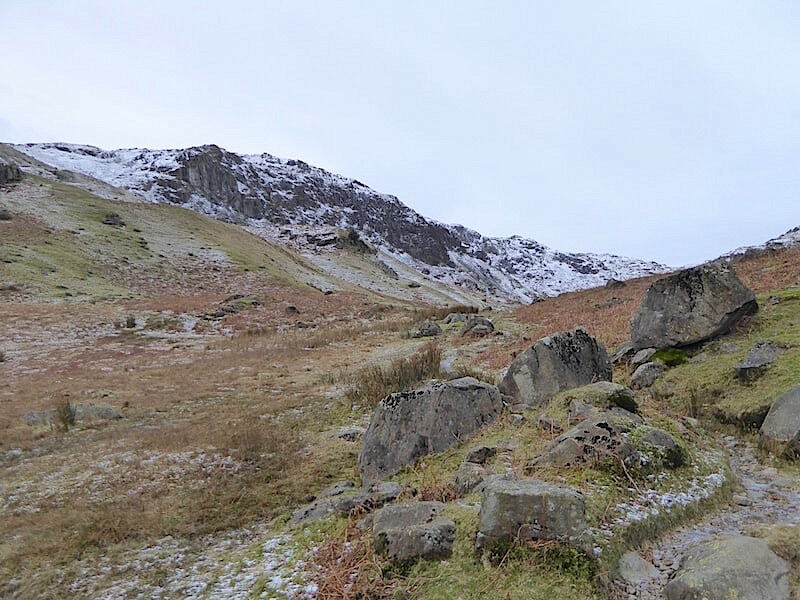 The spell of sunshine on Seat Sandal has dimmed a little, the sky above us has become quite dark and we’re hoping that the snowfall doesn’t get any heavier. Walking across Pike of Carrs towards Gibson Knott, and just wishing some of that sunshine was over here. 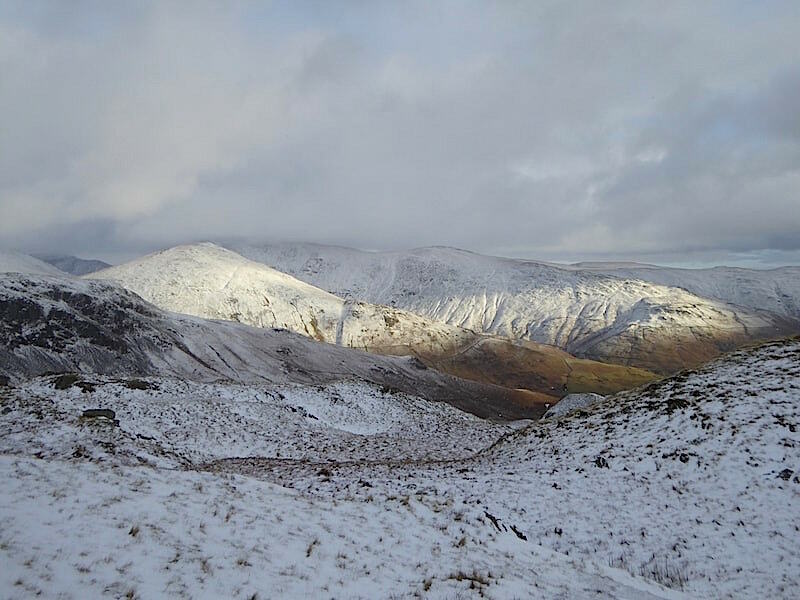 There’s nothing much to be seen beyond Steel Fell’s craggy western face now that Helvellyn and its neighbouring fells, together with Fairfield, are hidden by a large expanse of cloud. 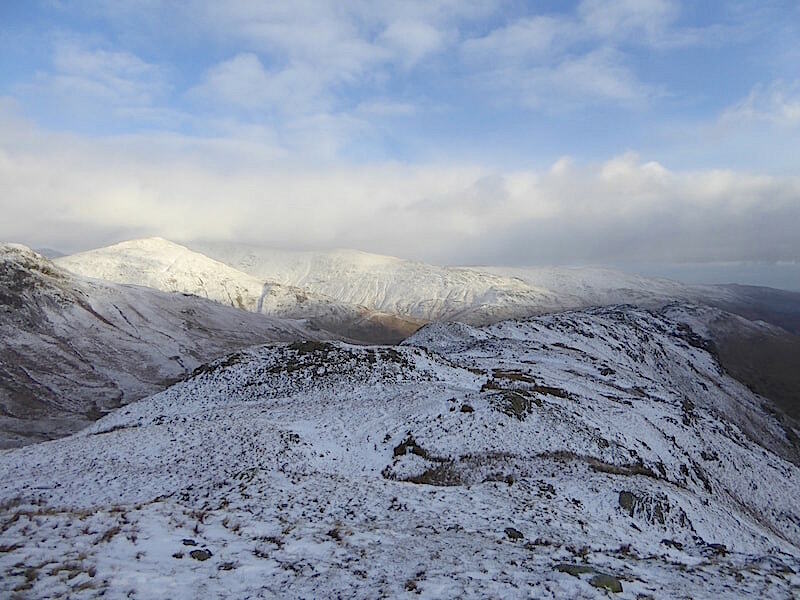 Seat Sandal is getting more than its fair share of sunshine today. 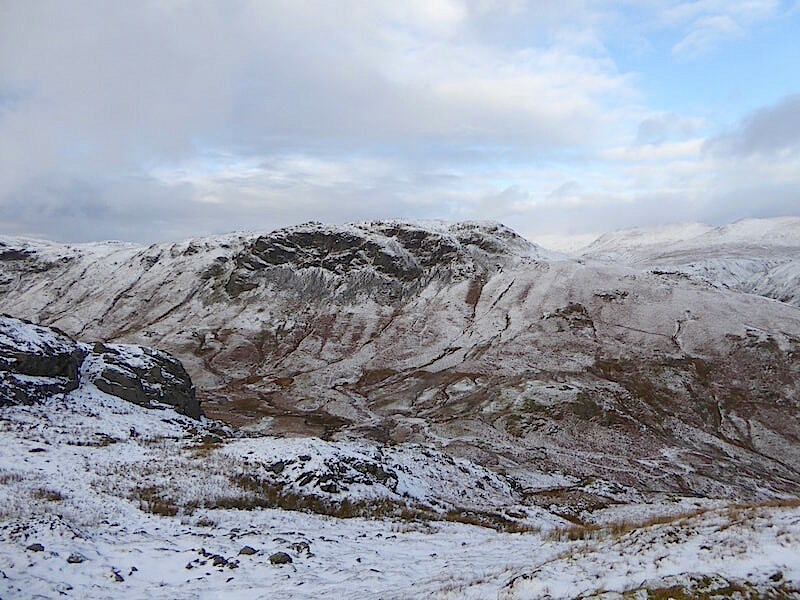 Looking across Far Easedale to Deer Bield Crag with Tarn Crag rising above it as we reach a more level section below Pike of Carrs on the right. 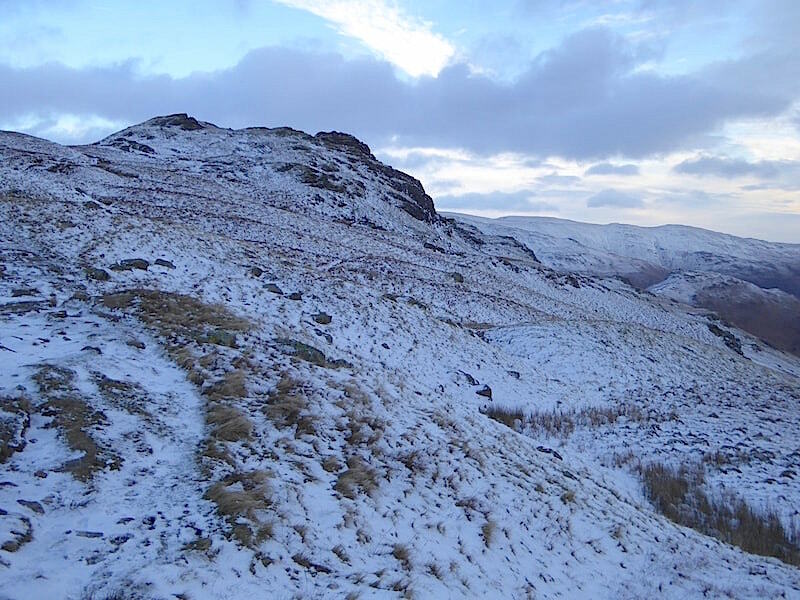 The snow has stopped falling now, the heavy clouds have drifted away and brighter skies return, which gives the spirits a lift as we carry on over to Gibson Knott. It could hardly be described as busy or crowded but there were a number of people, mostly pairs plus a couple of slightly larger groups, crossing the ridge in both directions today. The actual path wasn’t all that well trodden, and even disappeared now and again, so everyone seemed to be taking a slightly different route across. 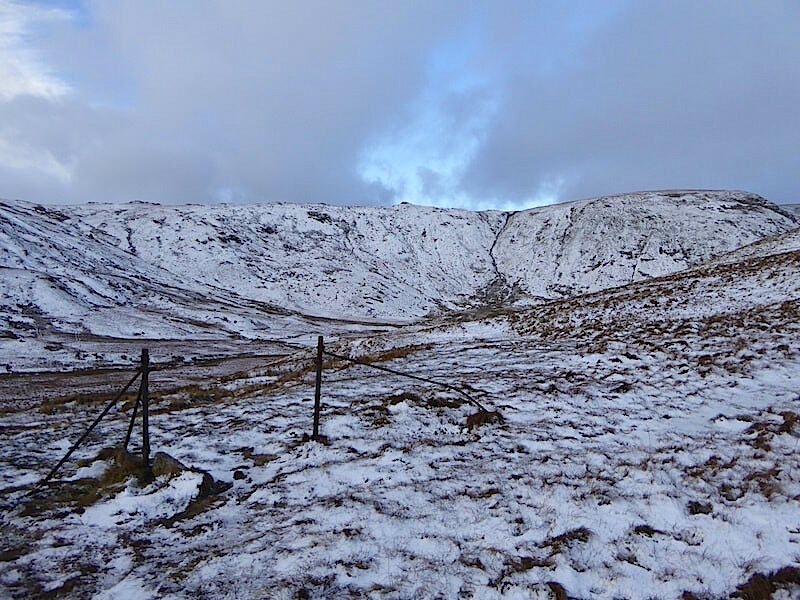 We kept to the Steel Fell side to enjoy the spectacular views of it across the Greenburn valley. It looks much more of a great beast in the snow than it does in its summer greenery. 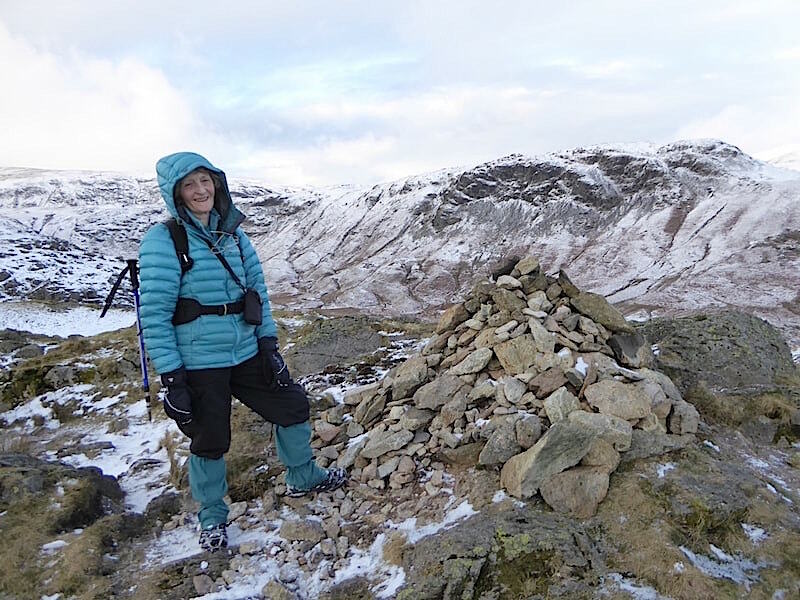 It was a bit draughty again on the summit of Gibson Knott so I took shelter in my jacket hood. I don’t like wearing them, but neither do I like wet trouser bottoms flapping around my ankles, but the gaiters did a grand job of keeping out the soft and powdery snow. The bank of cloud is still lingering over the Helvellyn range as we leave Gibson Knott and make our way over its numerous humps and bumps towards …..
….. 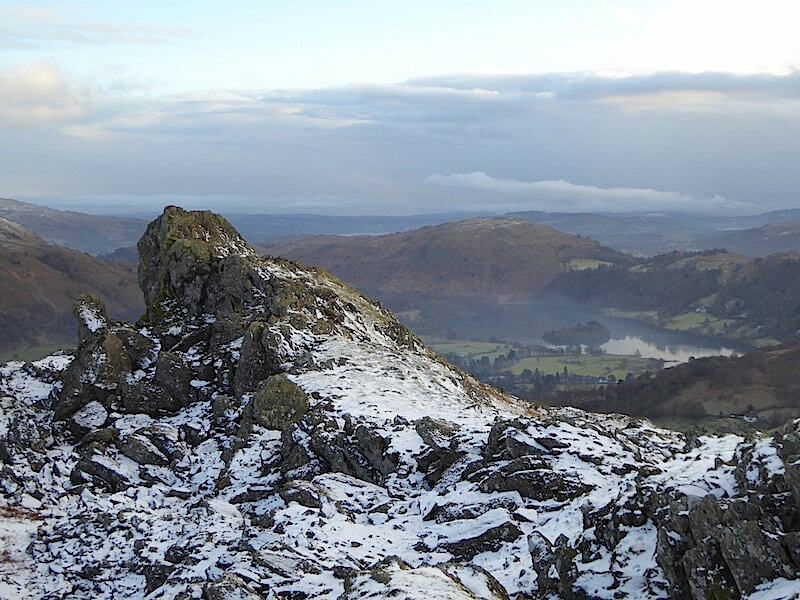 Helm Crag, the final summit of the day. The fells to the east are still getting the best of the sunshine, we’re below cloud again, and the skies to the south are looking very dark indeed. Actually they were a good deal darker than the shot suggests as the camera seems to have compensated to some extent. 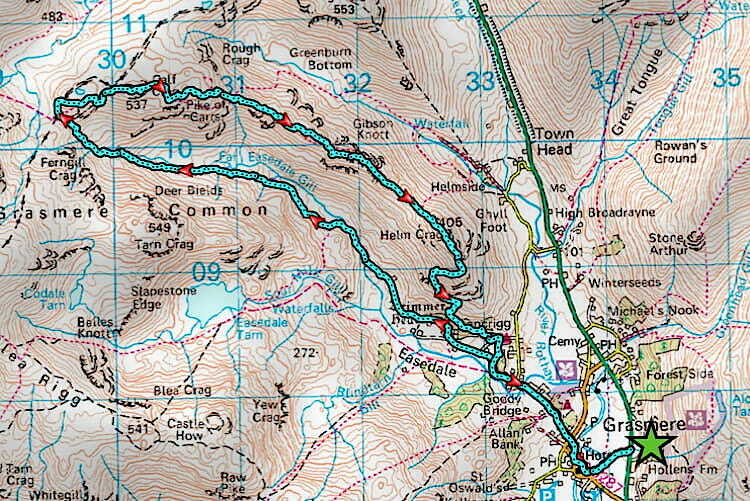 On we go then, down to Bracken Hause followed by the final climb of the day up to the summit. 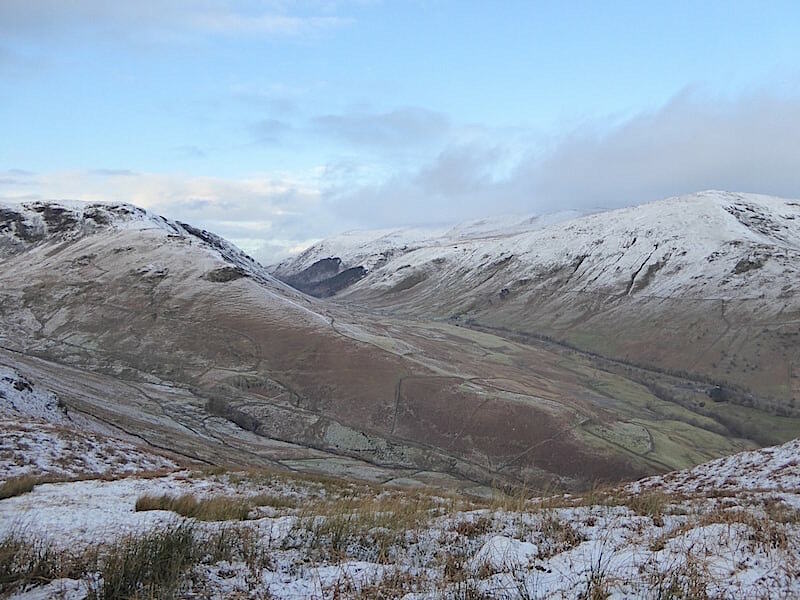 Climbing up from Bracken Hause and a look back at the two guardians of Dunmail Raise, Steel Fell on the left and Seat Sandal on the right. 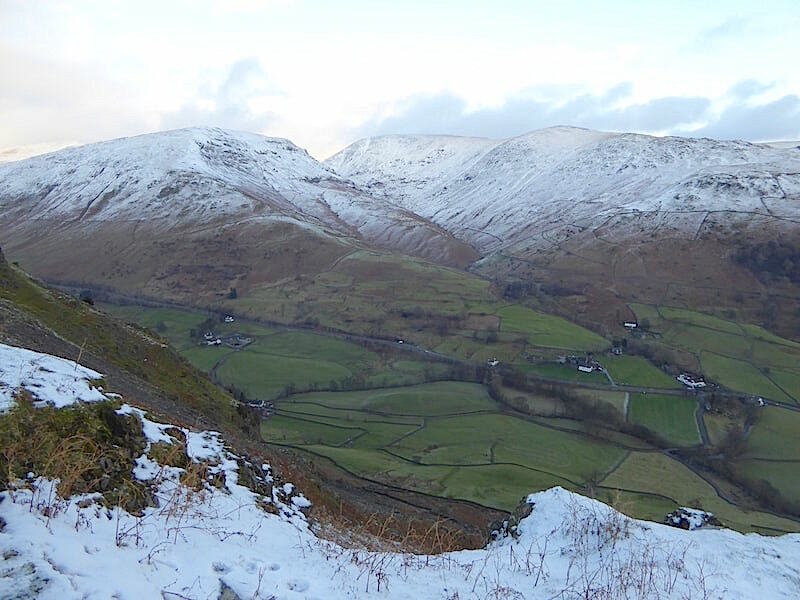 On the other side of the hause is a view of Far Easedale, far by name and far by nature. The gps gave us a distance of 4.88 miles from the A 591 lay-by up to the saddle. No visit to Helm Crag would be complete without a shot of ‘The Howitzer’ so here it is, and no, we weren’t tempted to have a go at climbing up it. AW never managed it either. Should anyone have the misfortune to fall off it at this end there is a gully filled with plenty of very large and unyielding boulders some distance below it waiting to receive them, alternatively there’s a very long roly-poly down into Greenburn from the other end. Another essential shot, this time ‘The Lion and the Lamb’ further along the ridge with the still waters of Grasmere just to the right of it. From Helm Crag the only way is down, the paths below are very icy so we still have to watch where we’re putting our feet. We haven’t used this particular path since 2007 and we noticed that some changes had been made to the path during the intervening years. 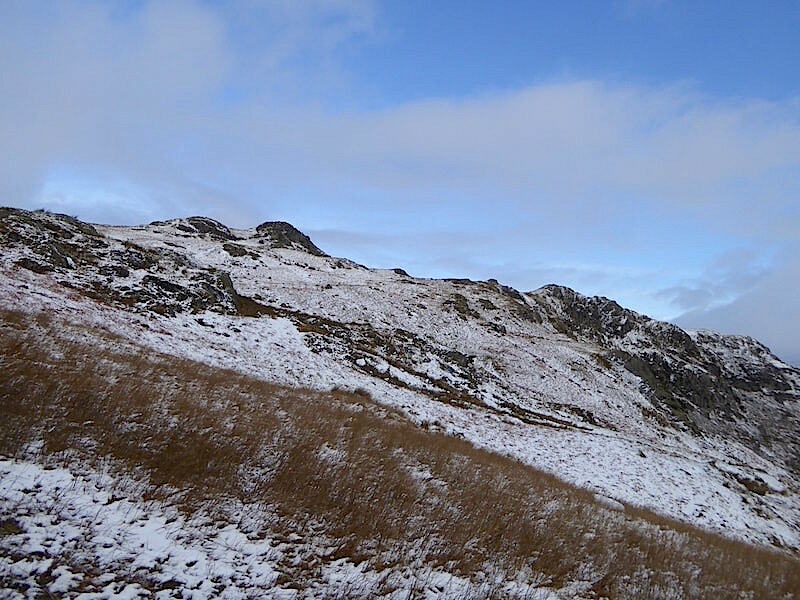 The steep and close cropped grassy section of the descent, located beyond the hill below us in the shot, was covered by a glassy sheet of ice down its length and most of its width so we used the bracken edges instead. Even with spikes we didn’t like the look of it. As we descend there’s the opportunity for one more shot of Steel Fell, Dollywaggon Pike and Seat Sandal before the view disappears. 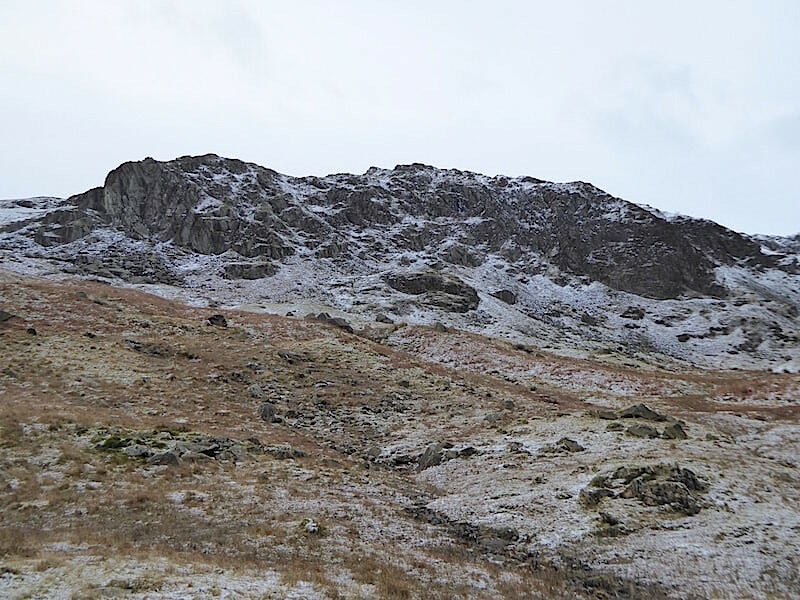 After negotiating some more very, very icy paths during the descent we make it back down to level and ice free ground once more where the spikes came off. A helpful sign if anyone needed it, courtesy of the Lancrigg Hotel, pointed the way back to Grasmere, via the hotel naturally. 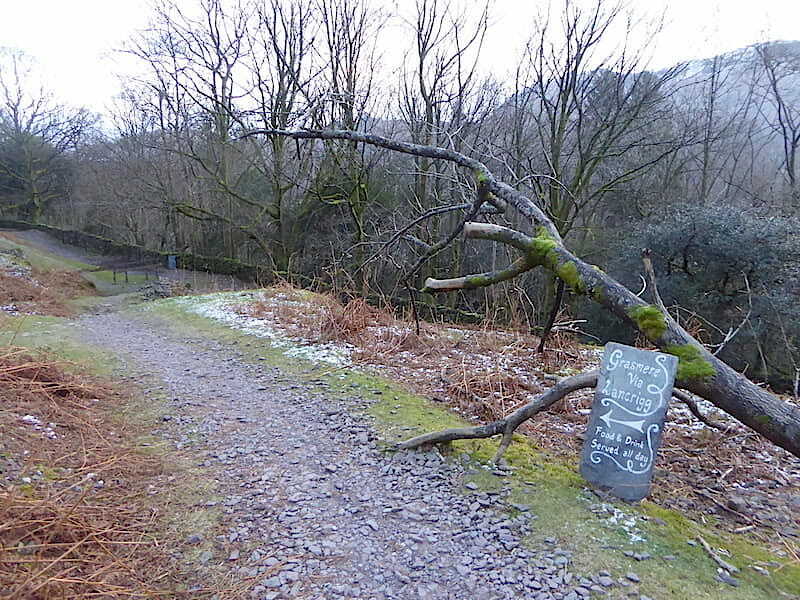 To tempt walkers even further they welcome ‘Muddy Boots and Dogs’ too. 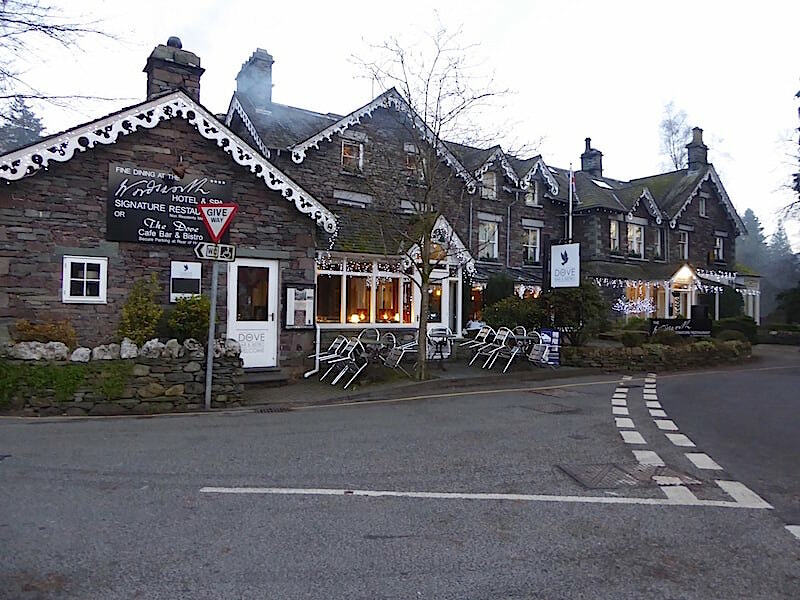 We didn’t call in at the Lancrigg Hotel so it wasn’t long before we were back in a very festive looking Grasmere, its twinkling Christmas lights brightening up the overcast afternoon. The tea shops, cafes and restaurants looked to be doing a good trade, and the shops weren’t doing too badly either with plenty of people around, doing a spot of Christmas shopping I suppose. We’ve enjoyed a great winter walk, in some testing conditions at times, and have just about squeezed every drop of daylight out of the day, so all that’s left to do now is cross over to the hotel over there, take the path between it and the Gingerbread Shop, walk back to the car and drive home for a well earned cup of tea.